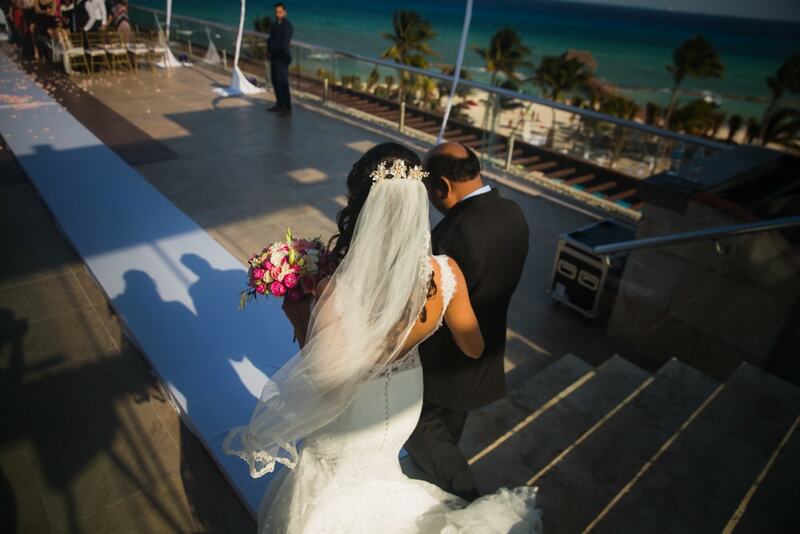 Sun, sand and water – the three ingredients that make Cancun and Azul Fives Playa del Carmen one of the most popular venues for destination weddings. 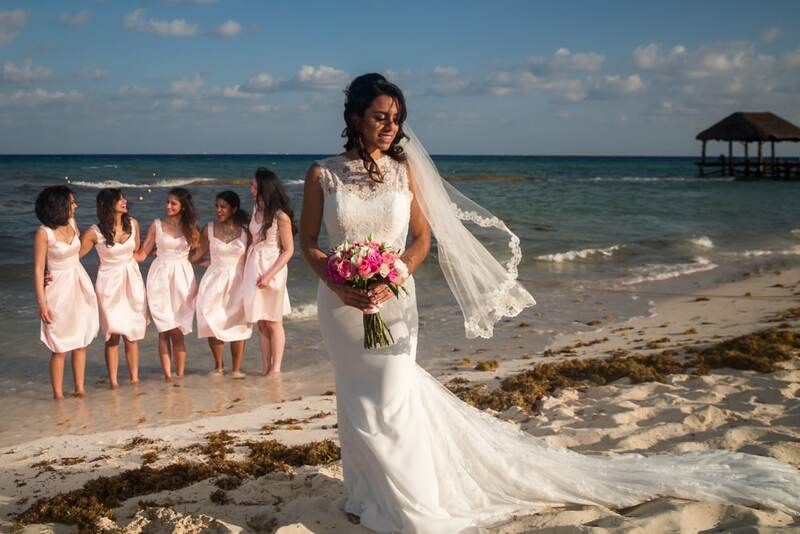 Each year, approximately 12,000-15,000 people get married on the blue beaches of Mexico. 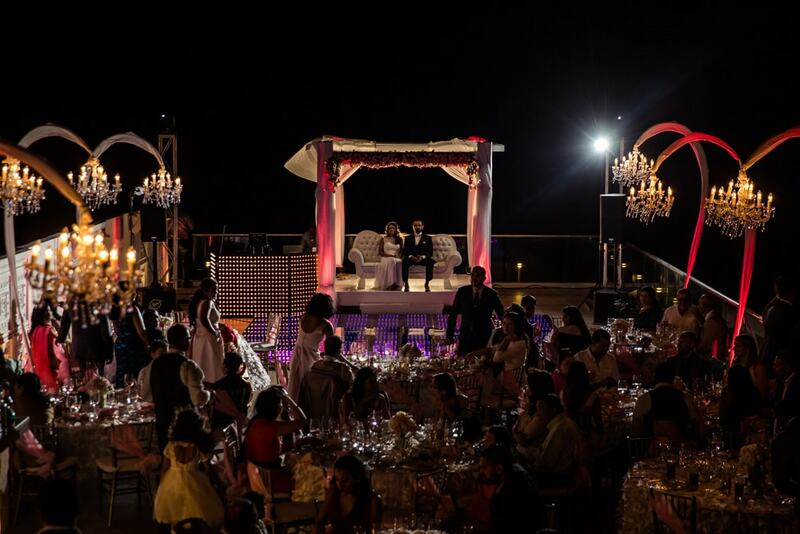 These resorts offer custom packages for destination weddings. 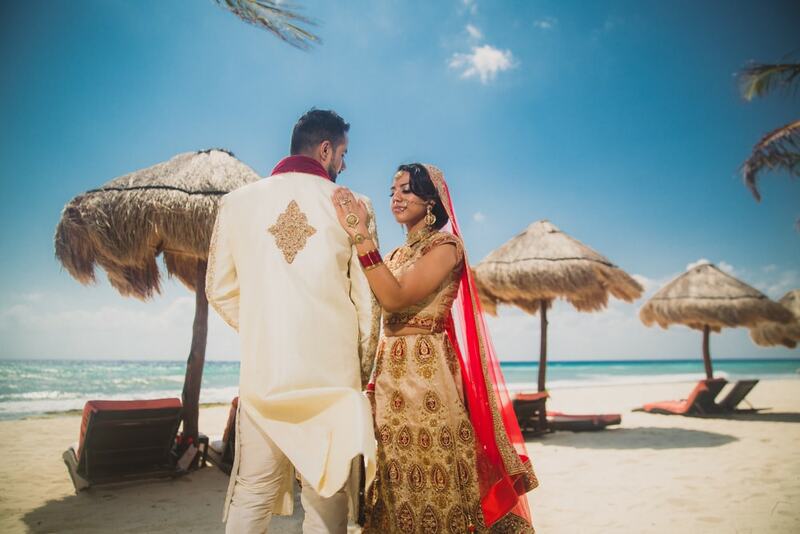 As Indian destination weddings are a growing trend – Cancun and Azul Fives Playa del Carmen are most favorable locations. 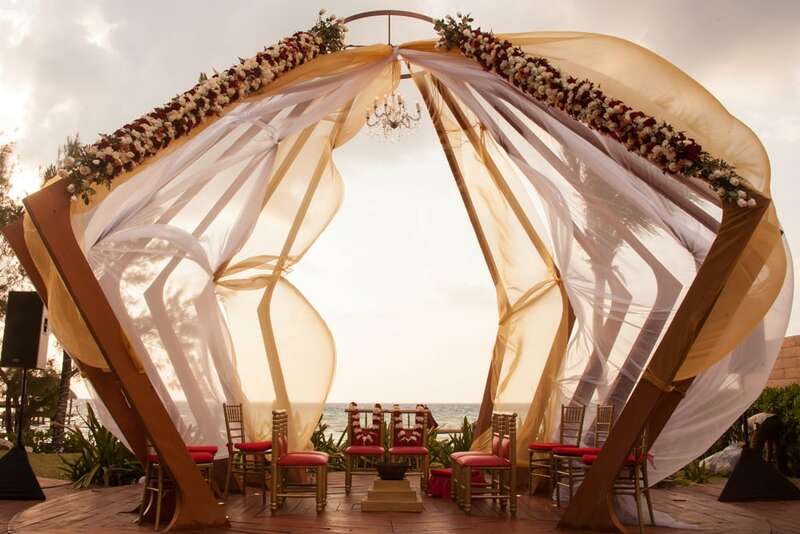 These destinations offer services tailored for Indian weddings. 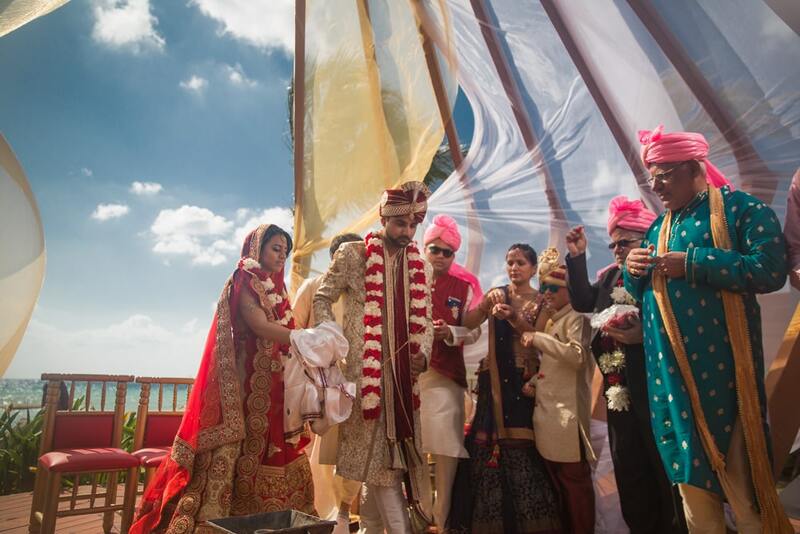 They serve authentic Indian food, arrange henna artists and horse rentals for Baraat Ceremonies. 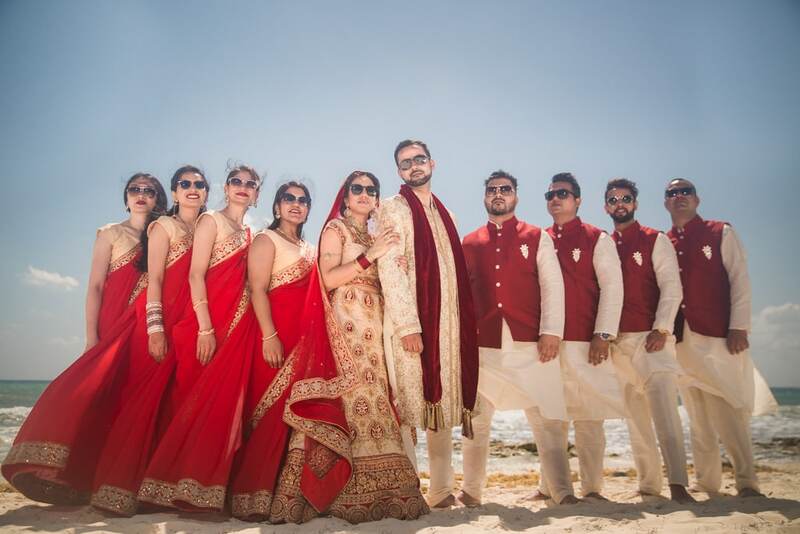 Azul Fives Playa del Carmen, an all-inclusive resort, known for its gourmet cuisine, was the venue for Paras and Veena’s grand Indian destination wedding in Mexico. 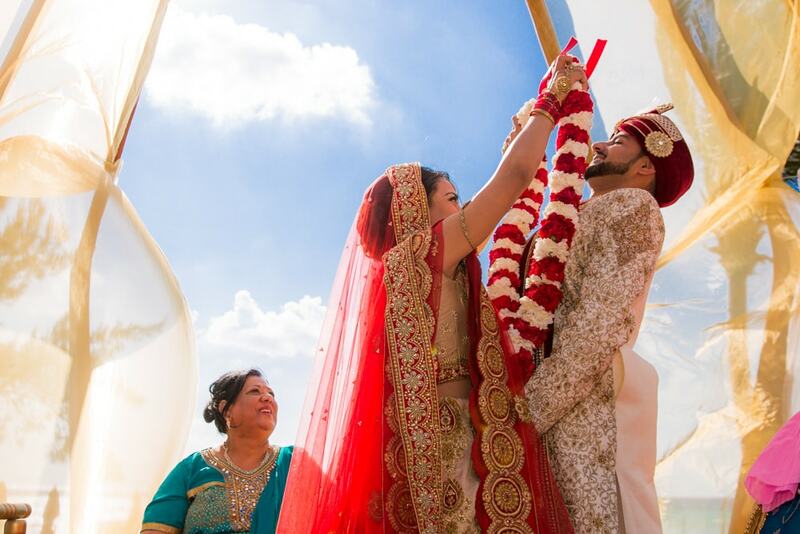 Paras and Veena are from Atlanta, Georgia, where they both met while attending pharmacy school. 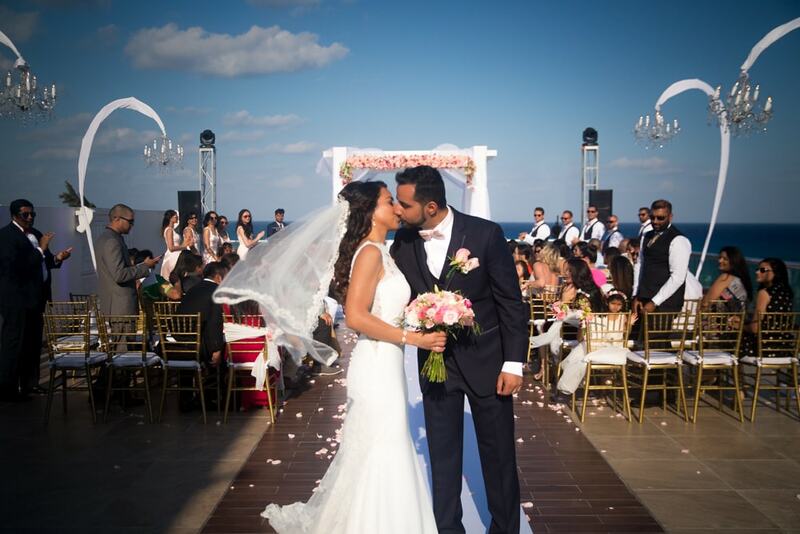 With their destination wedding, this personable couple essentially held a Pharmacy school reunion for the class of 2012. 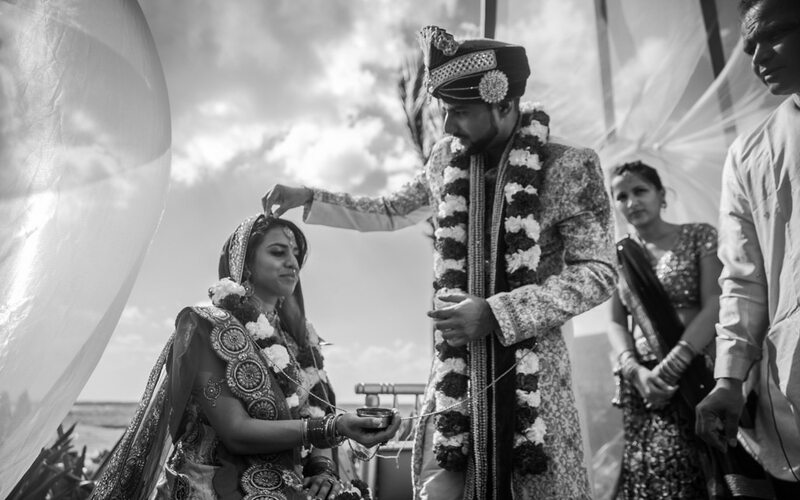 For a moment it seemed, that Atlanta might have run short of pharmacists for one week, as they all flew out for Paras and Veena’s wedding. 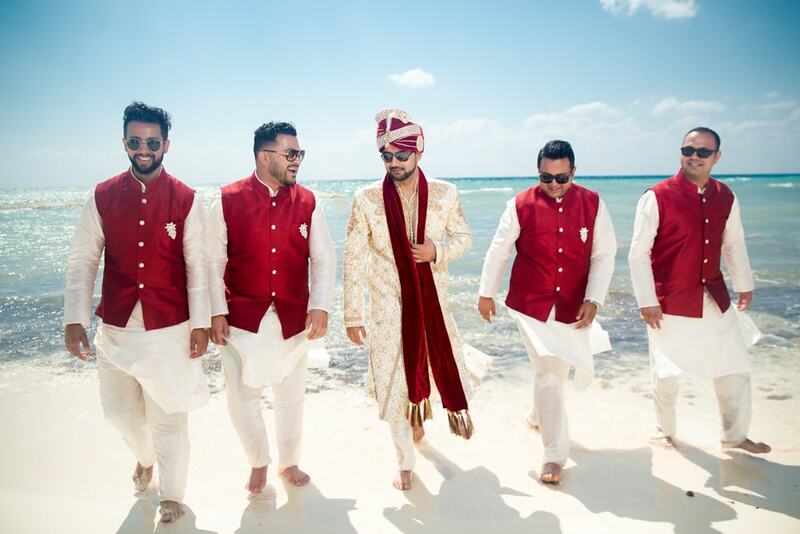 “When I received a message on social media from Veena, they were at the beginning of their destination wedding planning process and exploring who might be able to identify their concept and style. 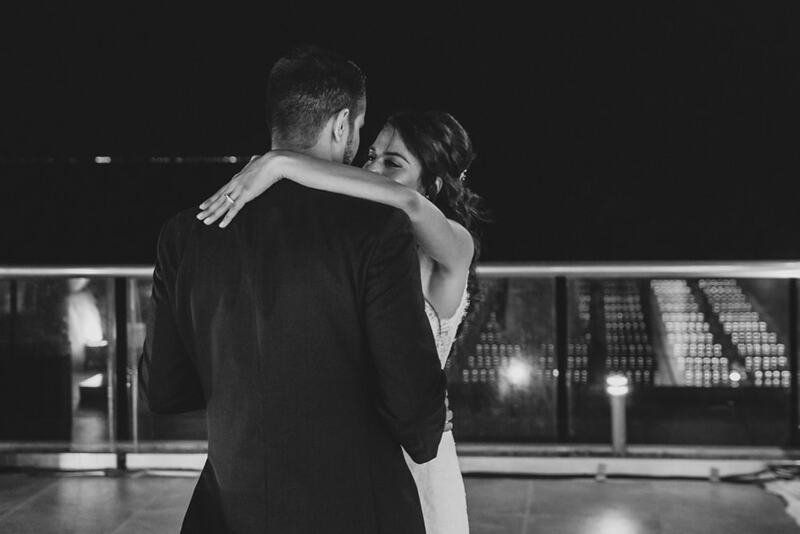 I immediately called them and within minutes understood their needs, desires, and fears. 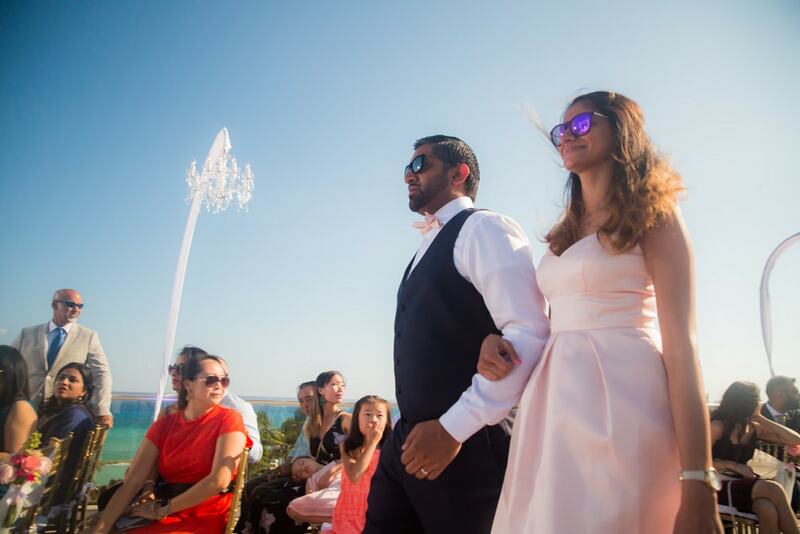 I explained to them the situation and challenges they were facing in planning a destination wedding from a distance. 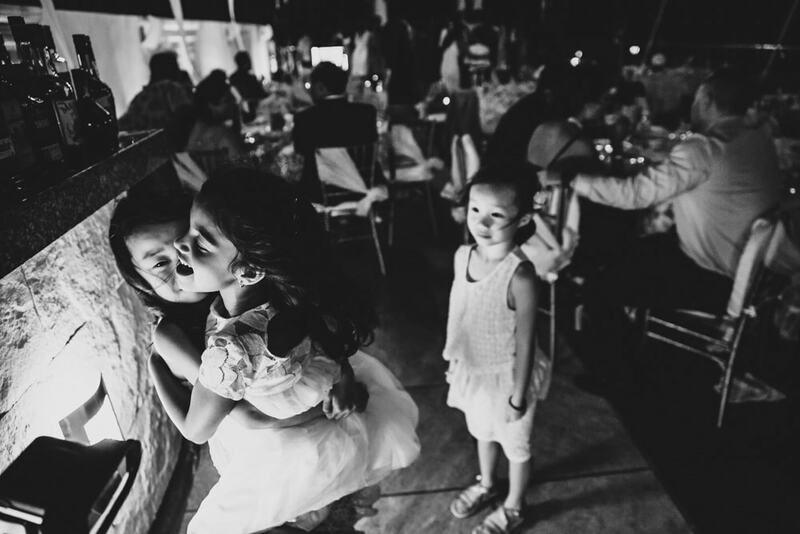 To ease their anxiety, I outlined a clear process. 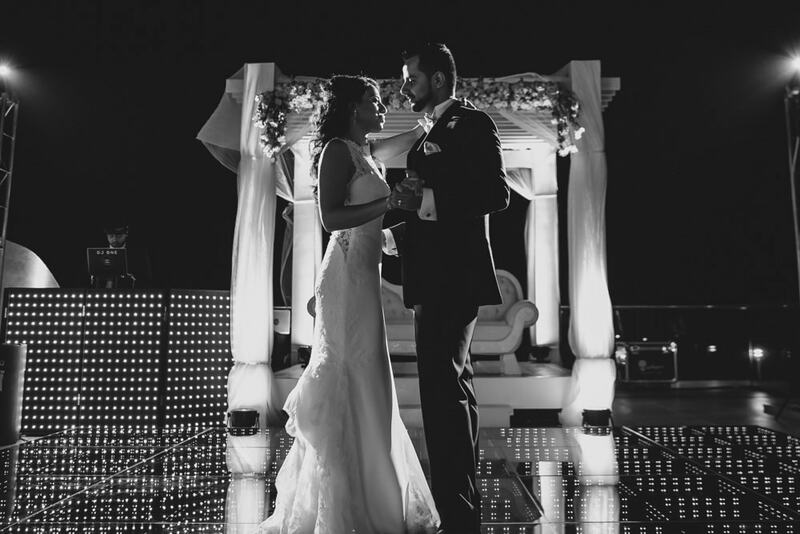 The rest was up to them – they reviewed our work through event photos posted regularly to social media and put together the inspiration for their wedding events. 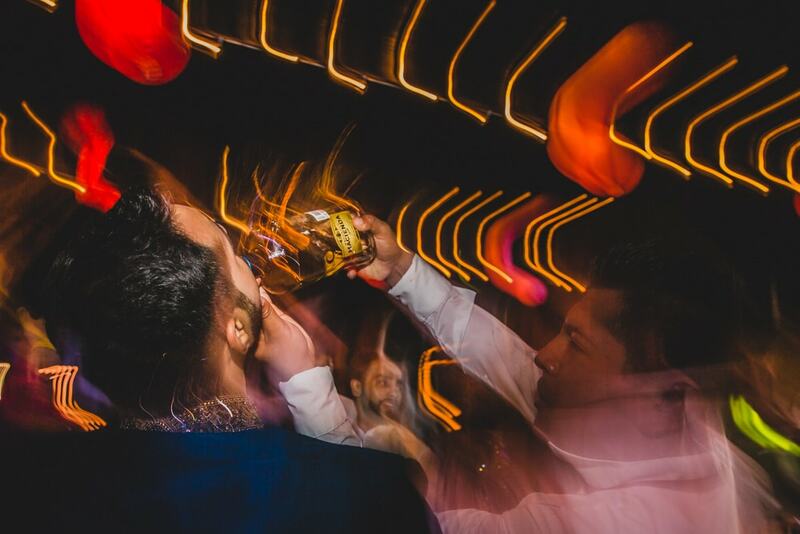 From there, we took care of the rest. 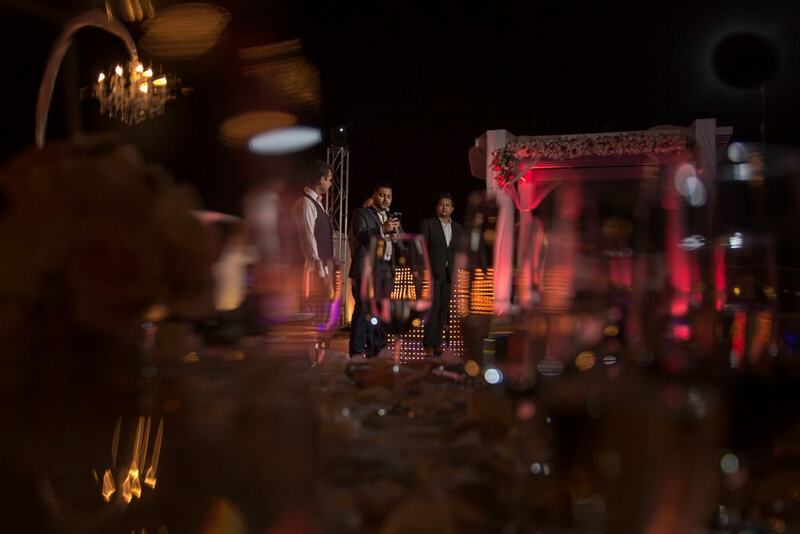 From the planning process to the execution and every last detail, we took care of them and focused on one single thing: bringing their vision to life! 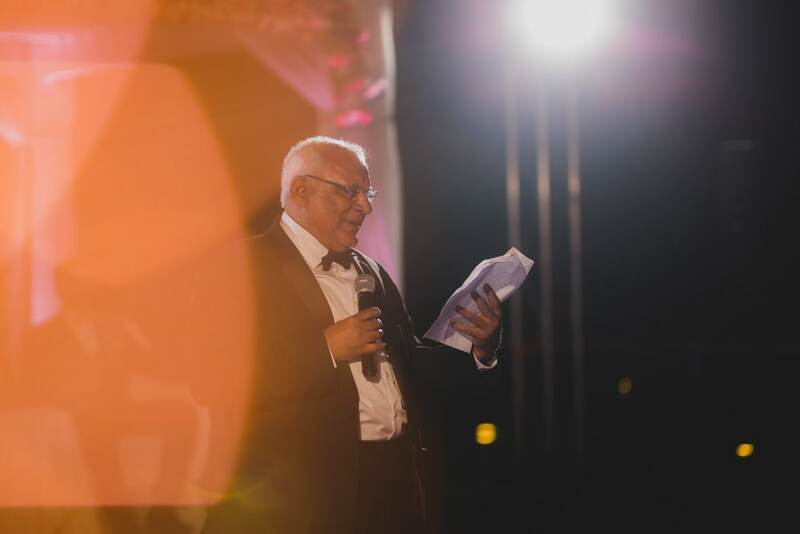 Here are some photographs from the ceremony – You may see for yourself! 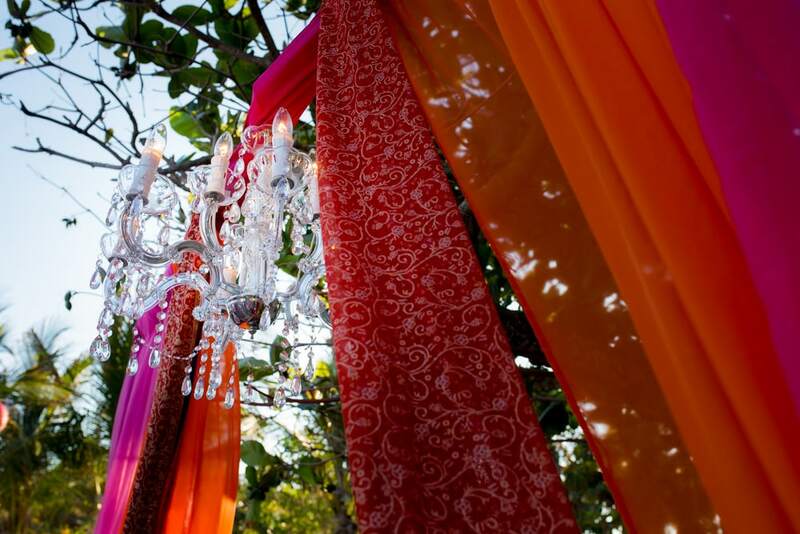 For the sangeet ceremony, Veena wore an off-white lehnga and Paras dressed in a colorful kurta, which offsets beautifully against palm trees background. 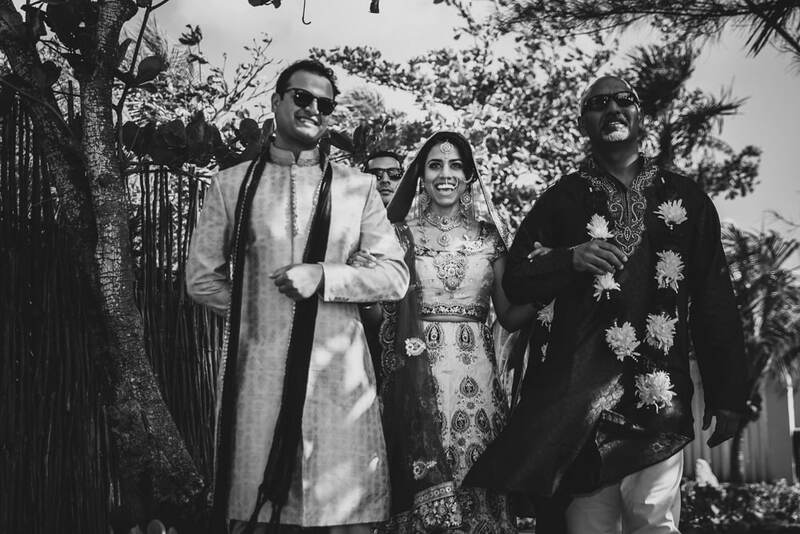 Veena entered the sangeet ceremony accompanied by her parents and mama ji, while Paras made an entrance to ocean view garden with his boys. 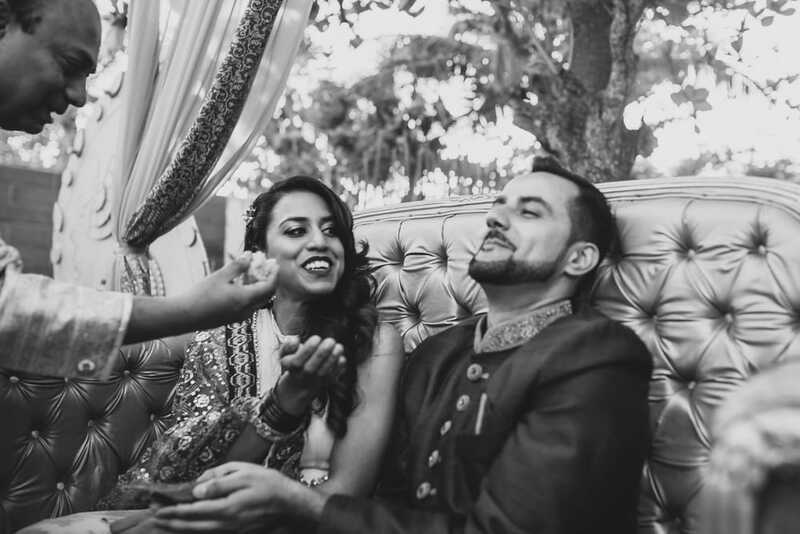 The sangeet ceremony unfolded with mehndi and maiyaa. 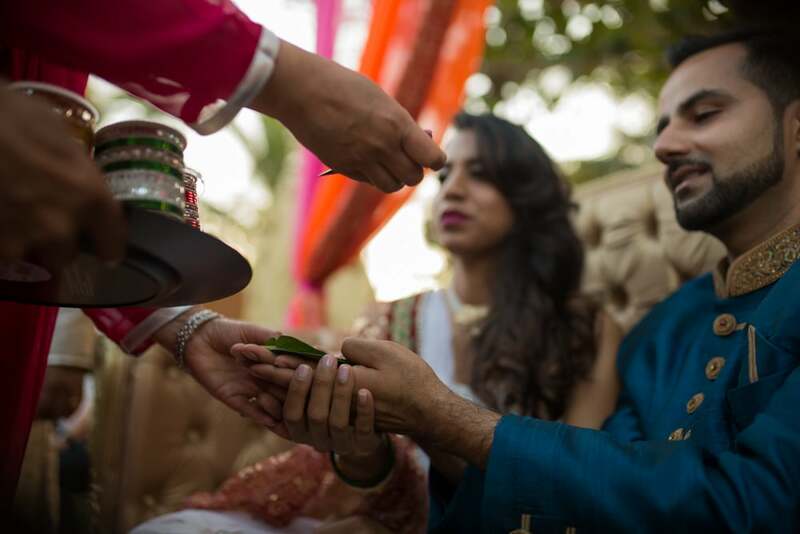 These customs and rituals are an essential part of Indian weddings and at home, these rituals are assigned as separate events for separate days. 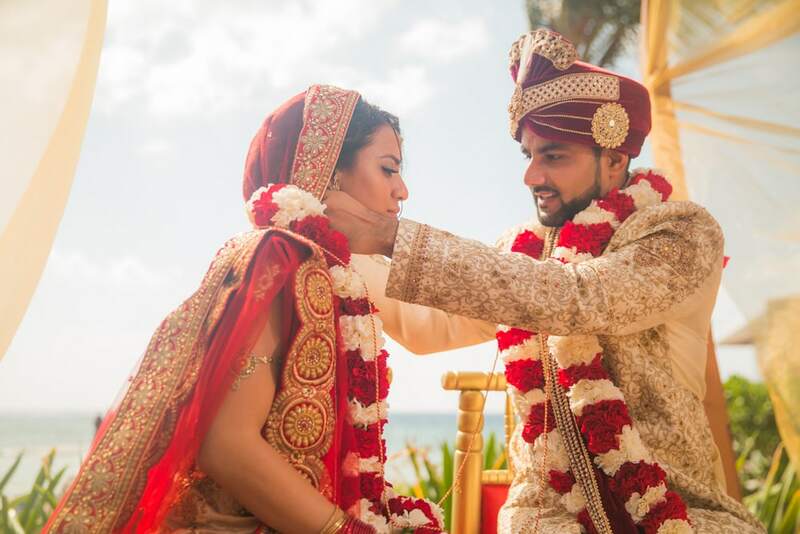 The rituals commenced and the couple arranged for a henna artist to join the beach celebration to apply henna for their guests as the families carried on the maiyyan custom for the couple. 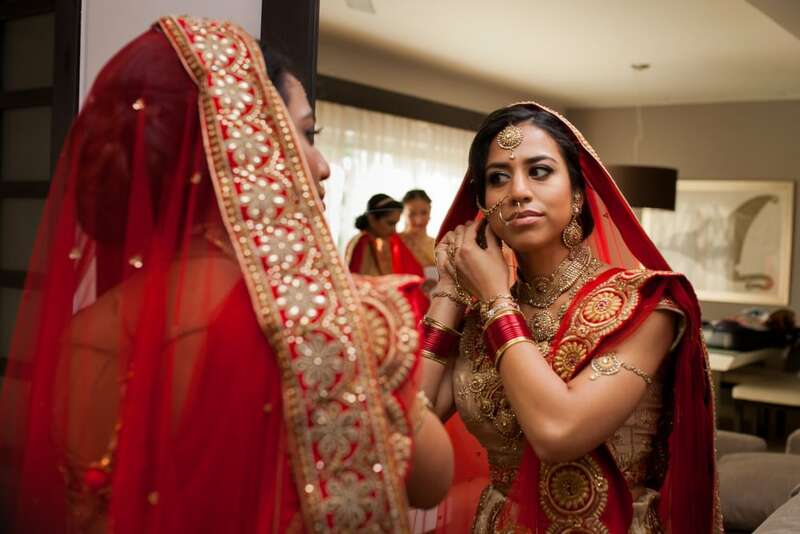 The food for the ceremony was catered by Taste of India – one of the best-known caterers for Indian destination weddings in Mexico. 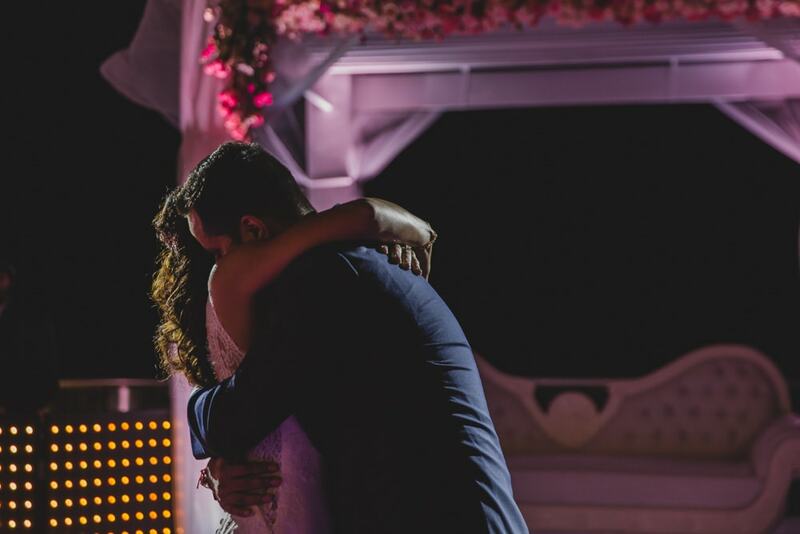 Even though the resort does prepare wonderful Indian food, it is important to note that couples have the option of bringing on an outside caterer of their choice. 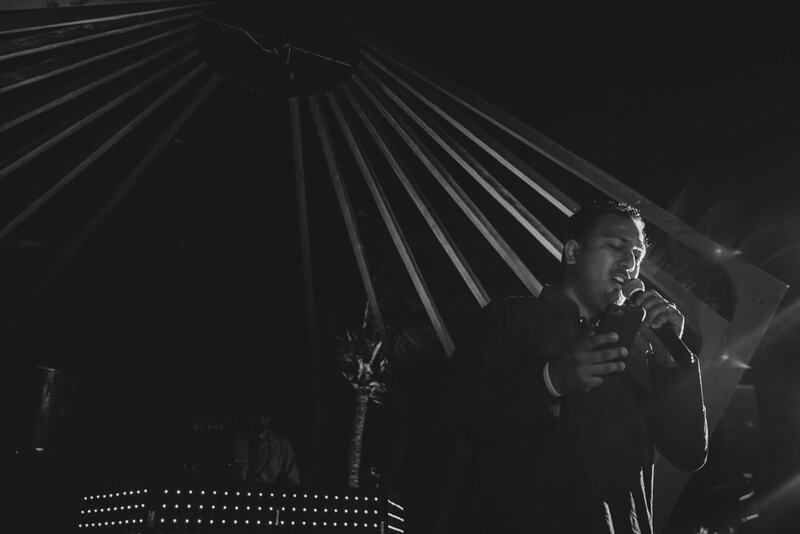 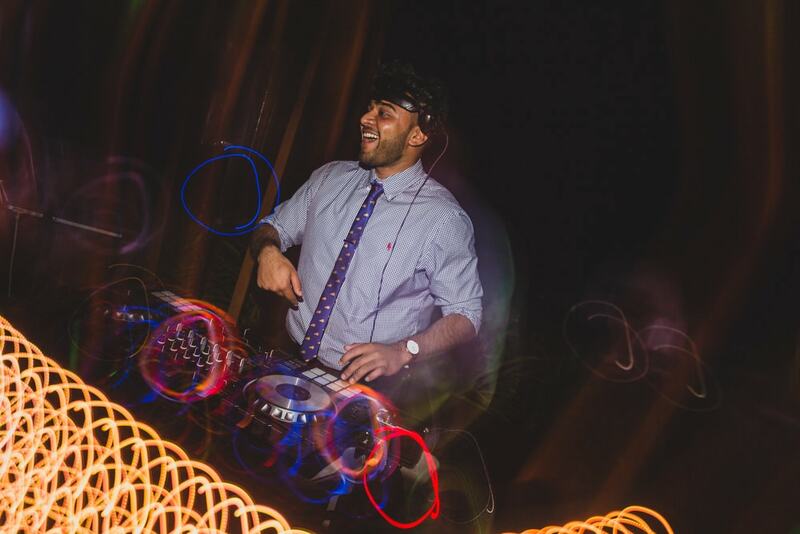 In our career, we have met some great DJs, but Hersh from Atlanta never fails to amaze us with his music selection! 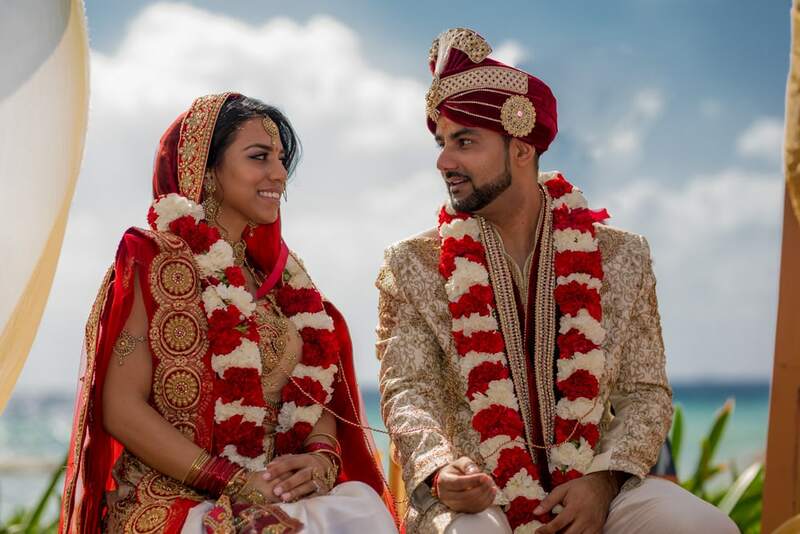 Alongside dholi and emcee Sumeet, who has played around North America, the couple had arranged for perfect entertainment team. 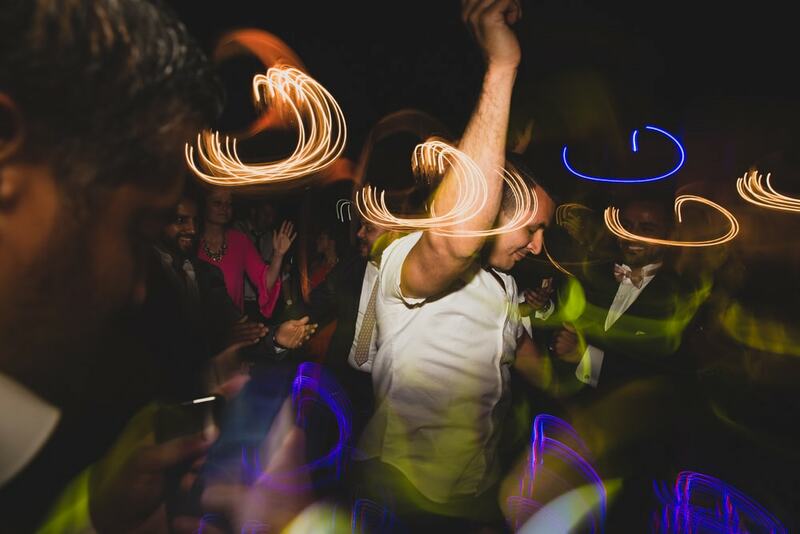 Hersh kept the party alive with tunes and Sumeet’s dhol was sure to get everyone on the floor! 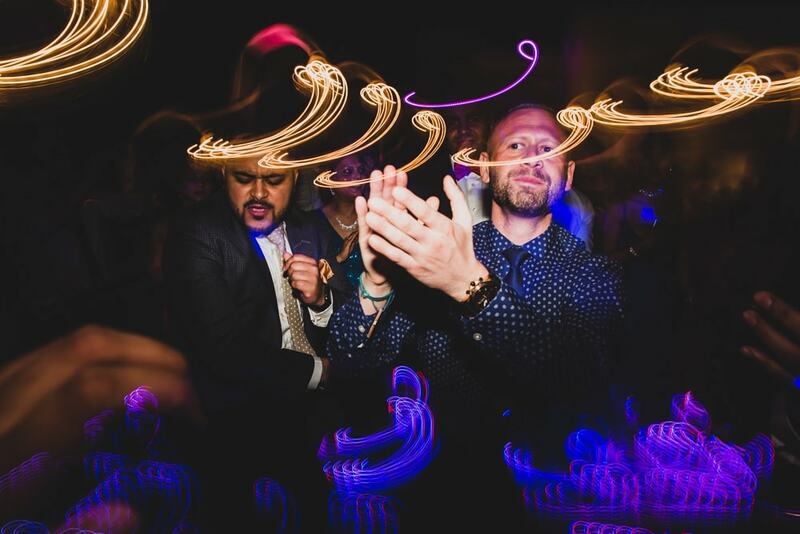 A mix of bolly, bhangra, and top 40 jams kept the party going. 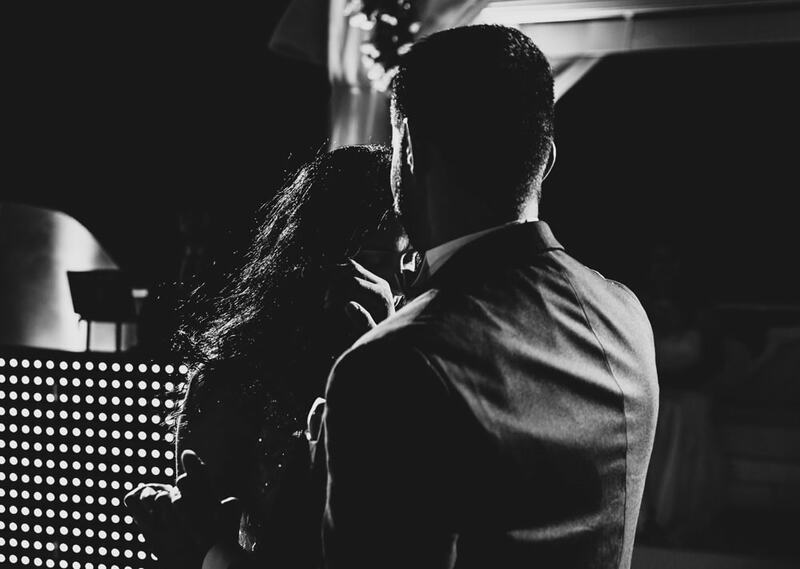 For destination weddings, we meet our clients over Facetime or Skype to make sure we understand their style of imagery and what they are looking. 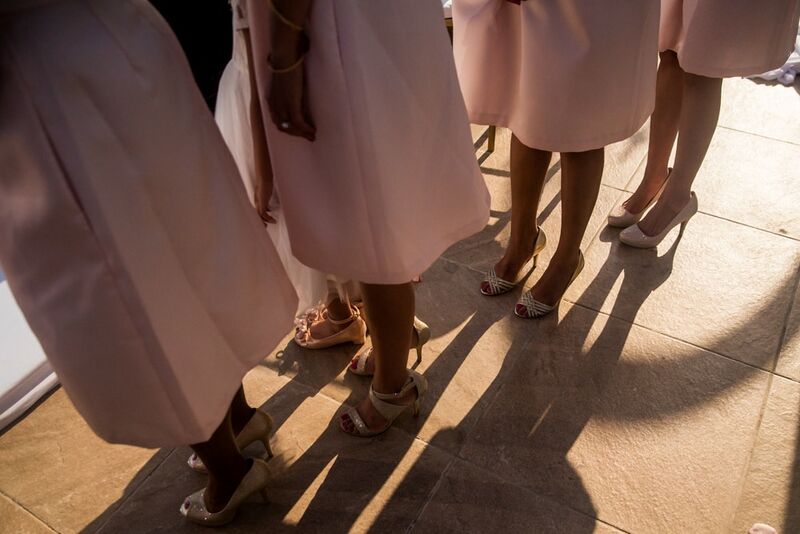 In addition, we work around planning ahead by communicating details like wedding day timelines, do’s and don’ts, etc. 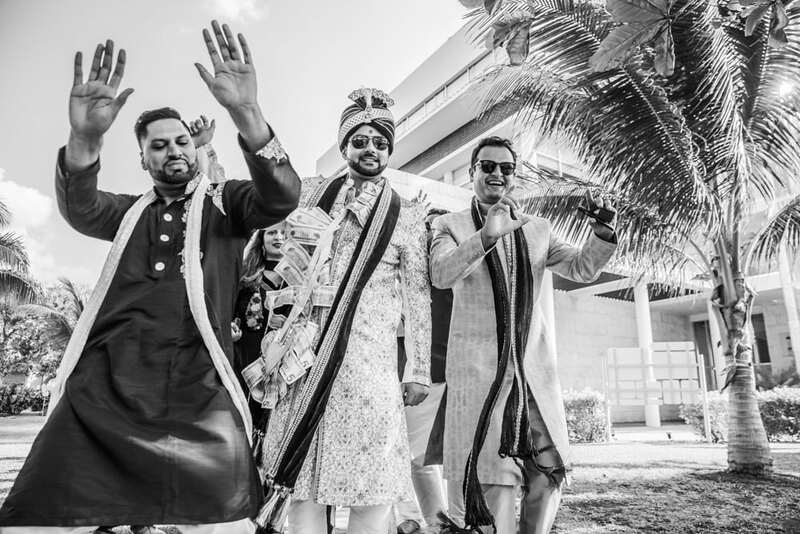 The baraat ceremony took place early in the morning following the sangeet. 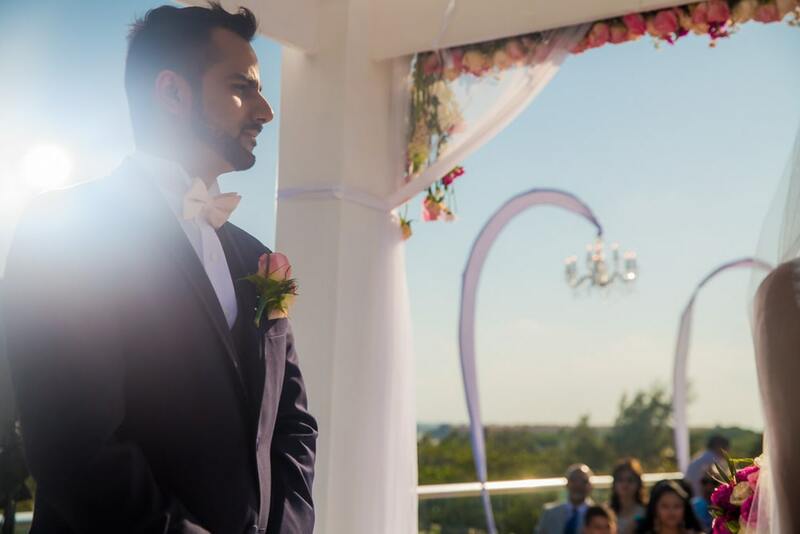 The ceremony took place near the pool, perfect to pick up a little breeze on a hot, sunny day.The mandap was set up by Latin Asia in the garden facing the beach and refreshing drinks were being served by the Azul Fives Resort. 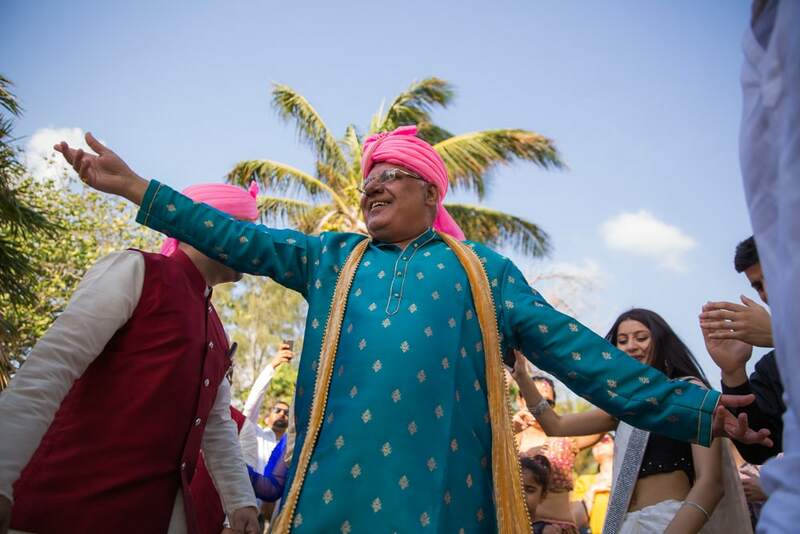 The Pandit ji flew from Atlanta to perform the cultural ceremony for this destination wedding. 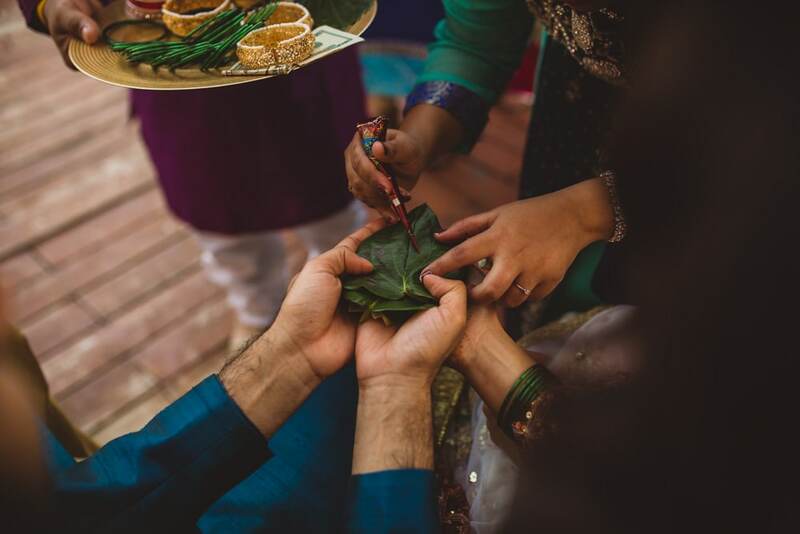 A big part of Indian values involves remembering our ancestors and elderly, Paras’s mother was not amongst us physically but her blessings were present. 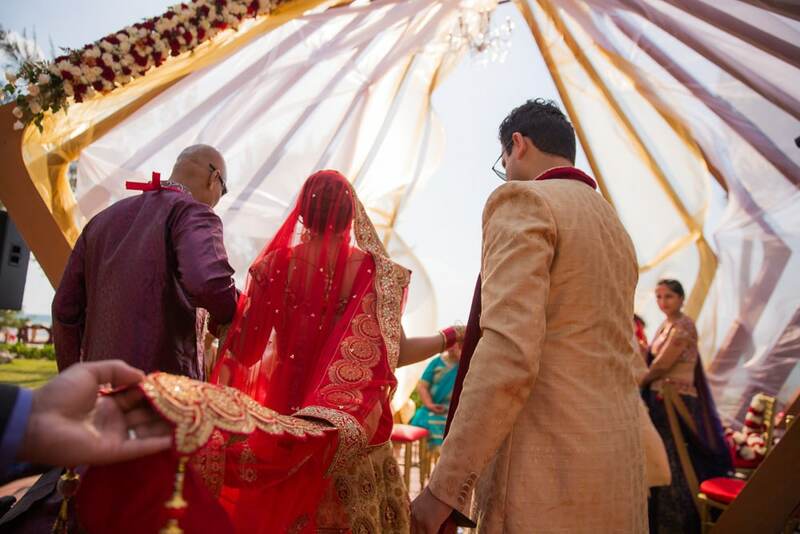 The bride was asked to join the mandap by the Panditji to complete the ceremony. 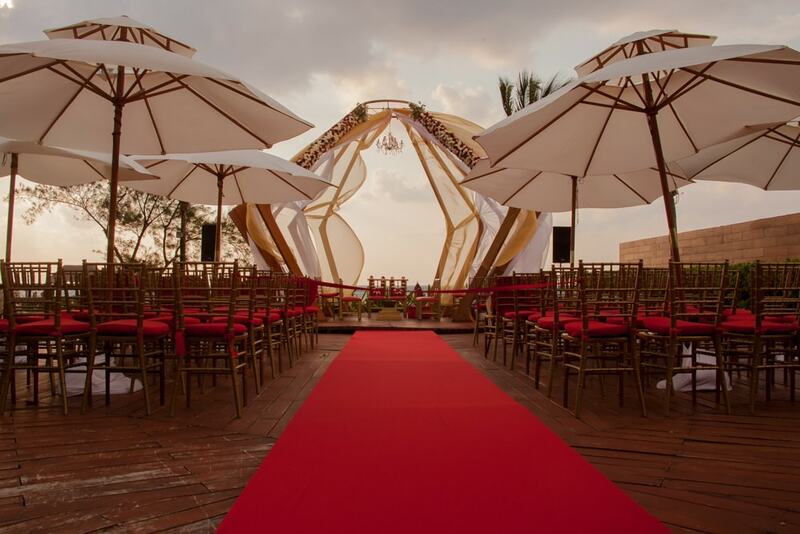 All eyes turned towards the path leading to the beach garden where the bride, walked down the aisle, Profoto in wearing a red and beige lehnga. 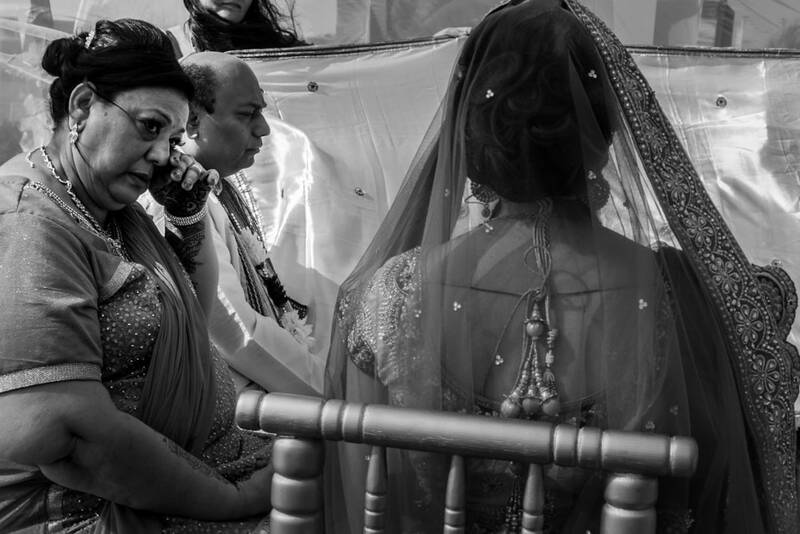 The bride was accompanied by her brother and Mama Ji. 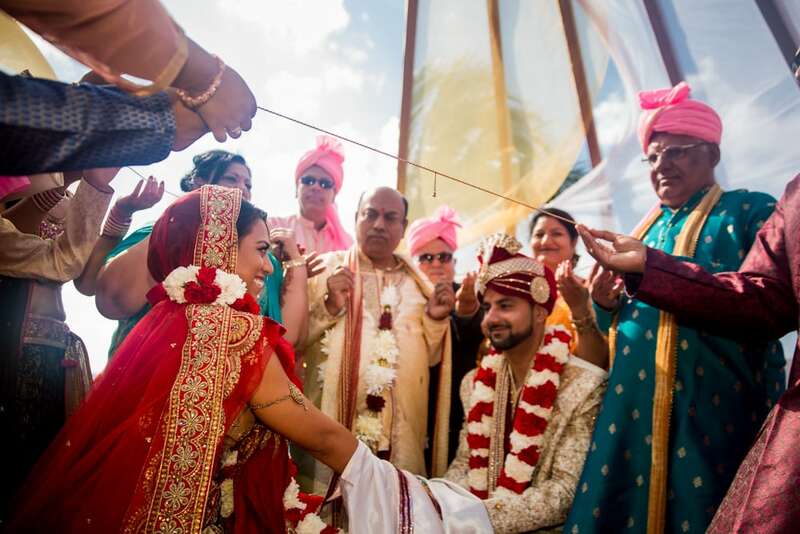 The Pandit Ji then invited the families to join the rituals and around the holy fire. 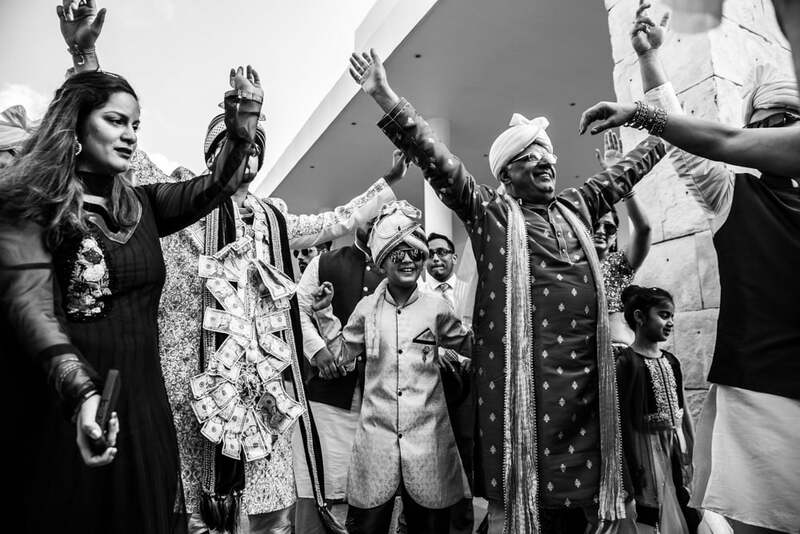 To be pronounced husband and wife, the couple is required to circle the fire seven times committing themselves to the Hindu marriage vows, while the priest chants holy prayers. 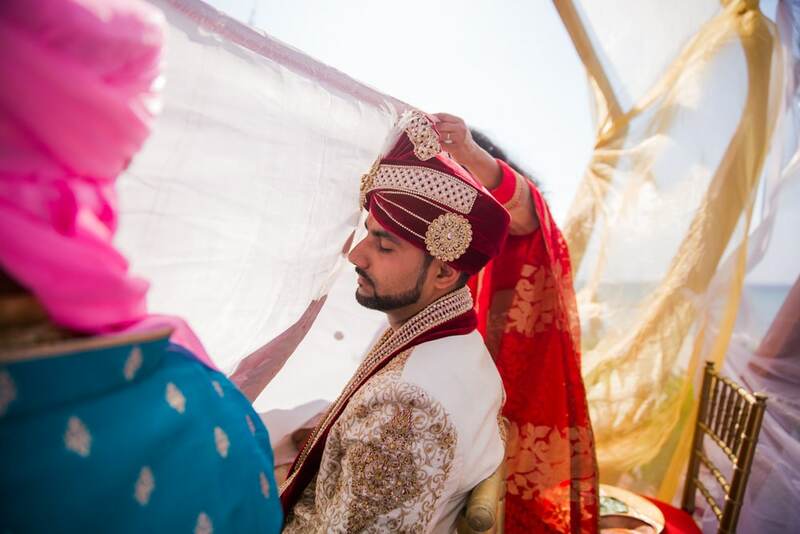 In Hindu ceremonies, the groom’s face is hidden with a fabric by his sister-in-law or other family members until after the ceremony. 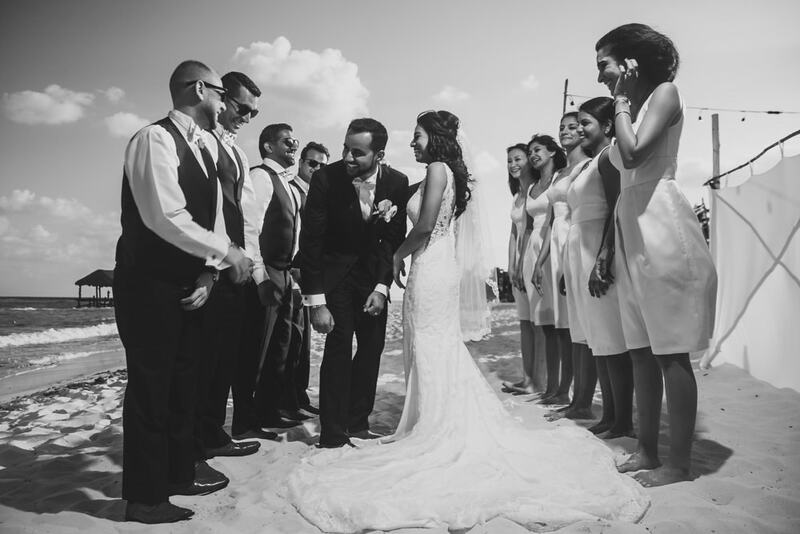 Right after the ceremony, we moved the wedding party to the beach. 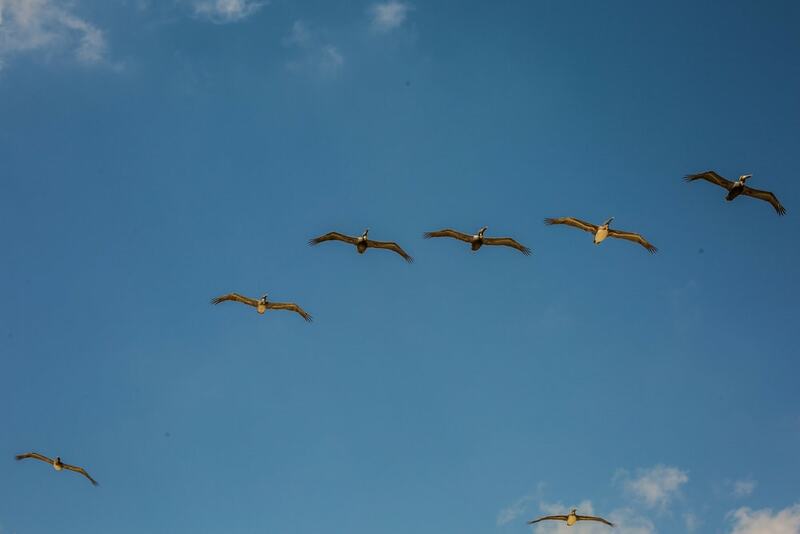 Azul Fives Playa del Carmen opens up doors to beautiful vast stretches of turquoise water and sandy beach. 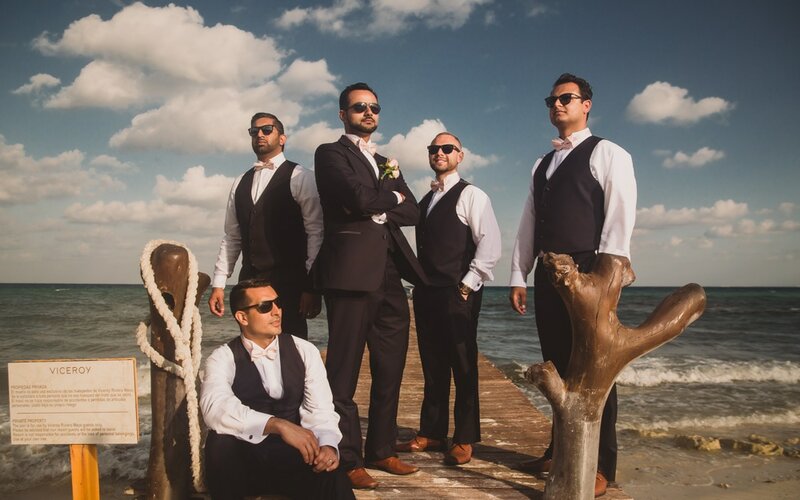 Photographing a beach wedding on a sunny bright day is one of the most difficult tasks, as the sun often creates a bright backlight which darkens the focus. 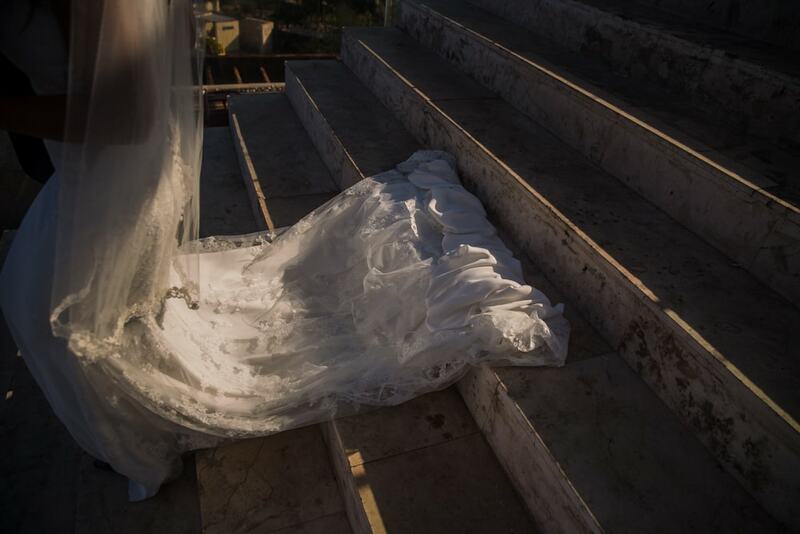 It is recommended to shoot with high production lightingProfoto in order to neutralize the sunlight. 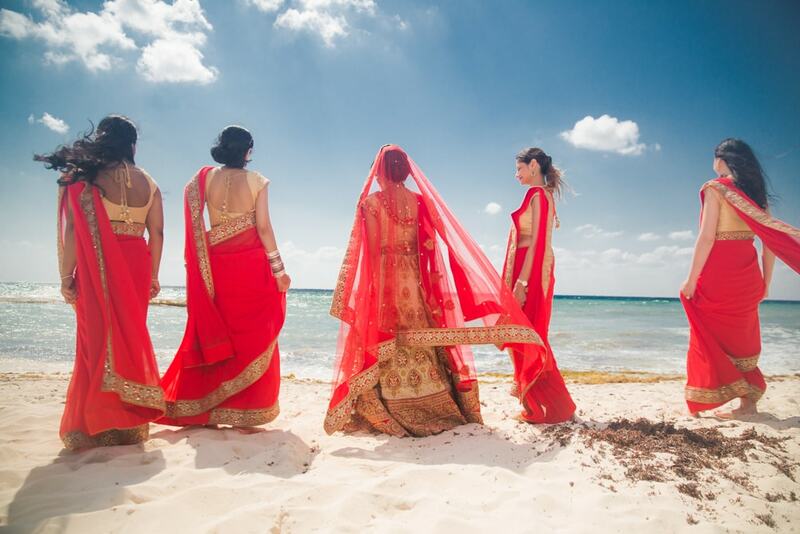 Indian weddings are all about vibrant colors and when photographing Indian couples on a beach, the colors stand out beautifully against the canvas. 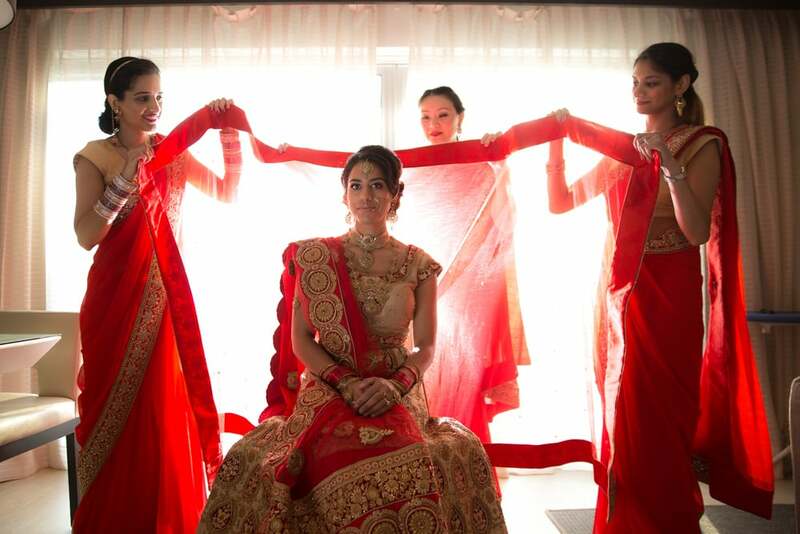 The bridesmaids and groomsmen complemented one another with their red sarees and beige kurtas. 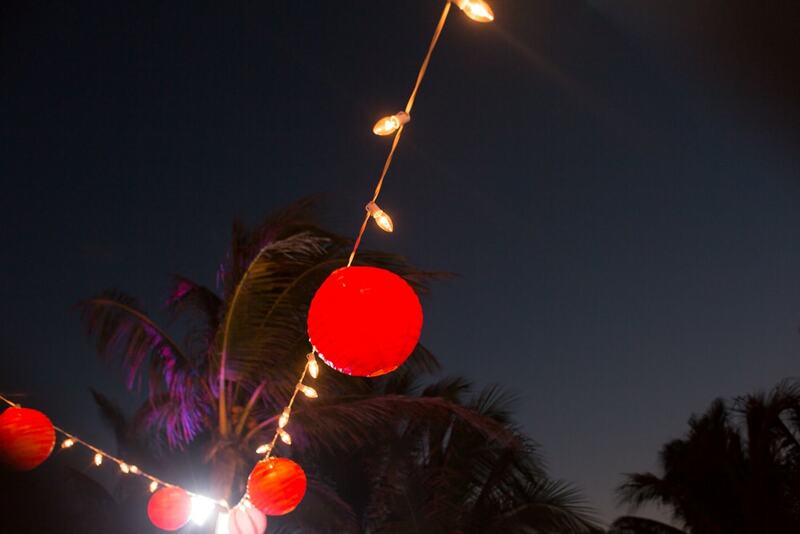 Azul Fives by Karisma is known for this gourmet all-inclusive experience. 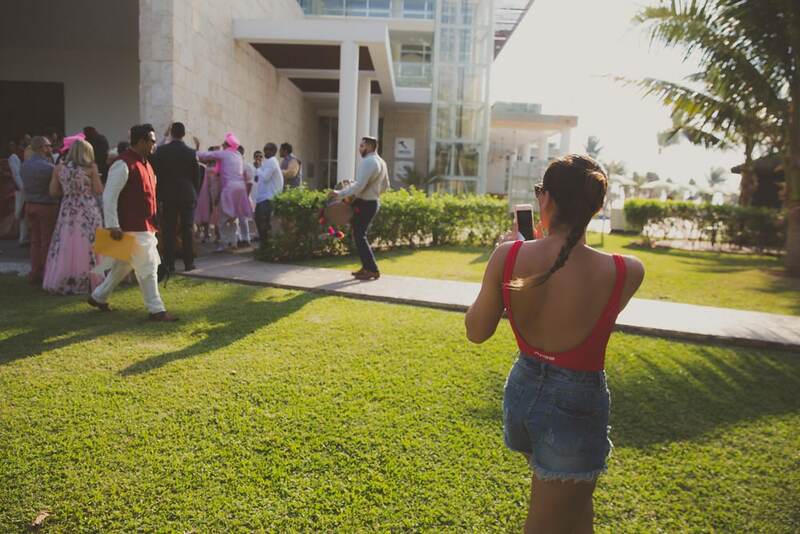 We did not know exactly what that meant until we joined the guests and wedding party for lunch after the ceremony. 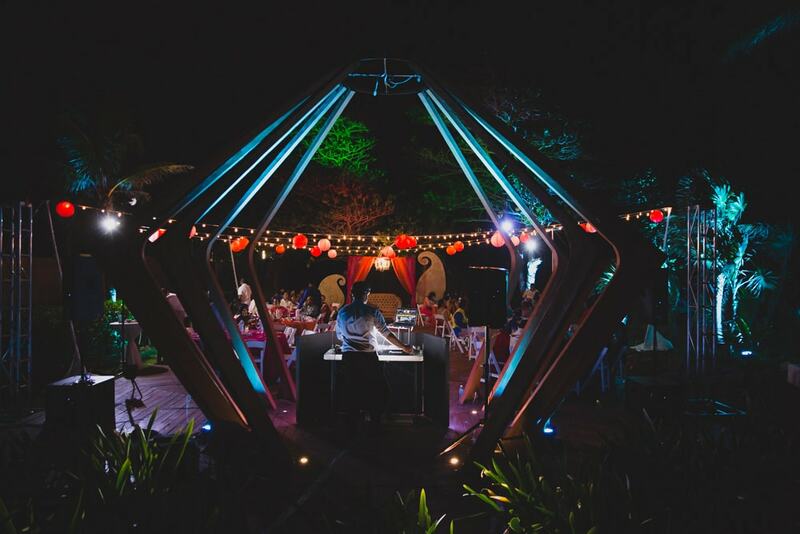 This was one of the best 5-course meals we’ve been served! 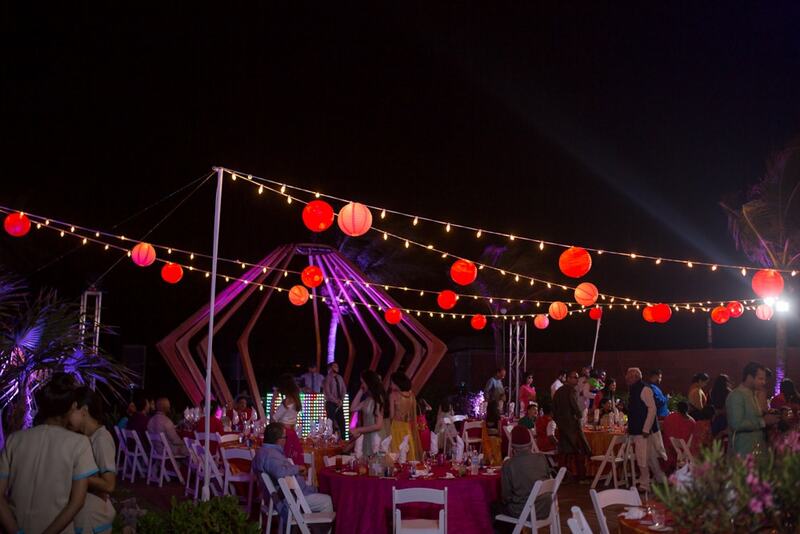 There are about eight different restaurants on this property and they all out do each other in terms of food quality and service. 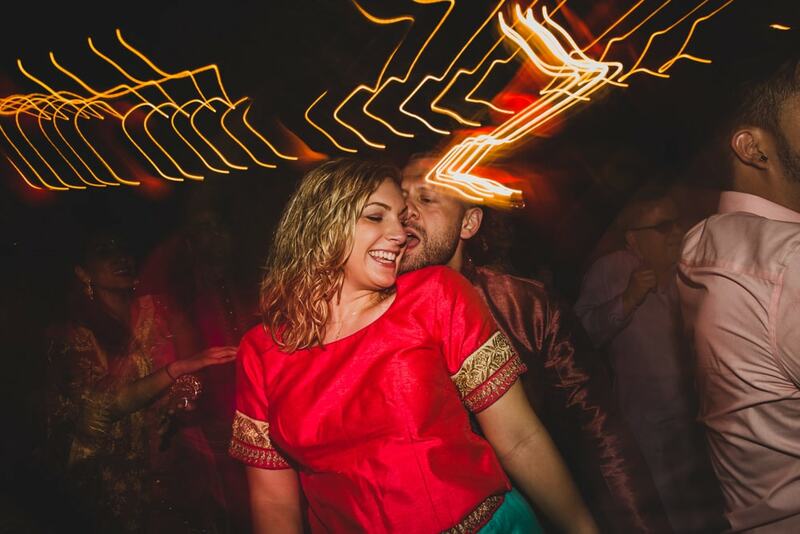 Veena’s ancestors are from Goan Catholics and you can see her Goan roots when she gets on the dance floor. 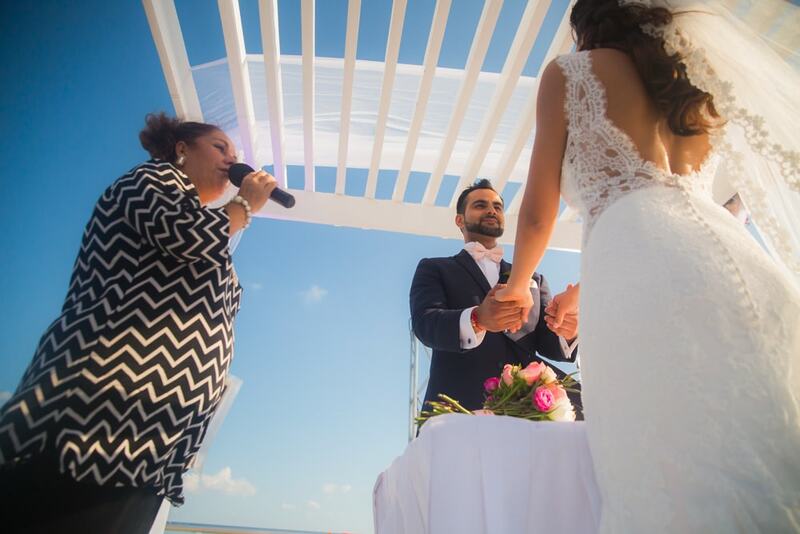 Christian wedding ceremony was set up on the skybar rooftop at the Azul Fives. 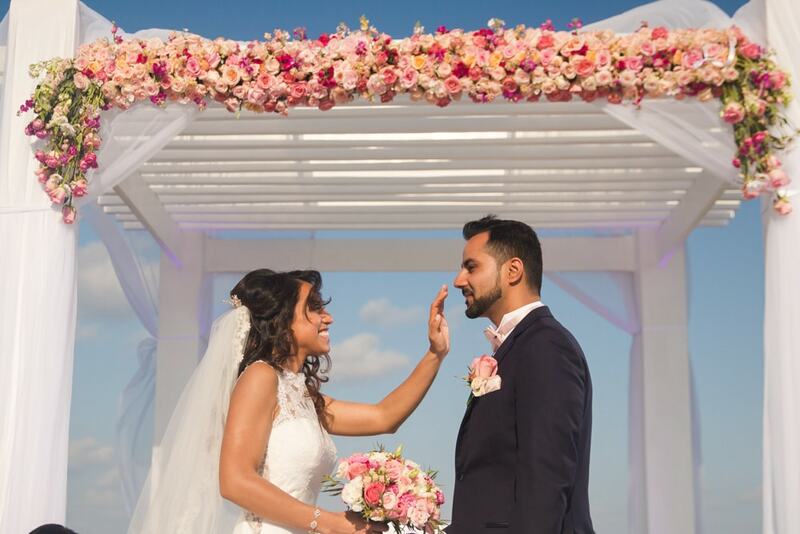 The deck was facing the blue sky and turquoise waters at Riviera Maya ocean, which was decorated by Latin Asia in fresh pink and peach flowers. 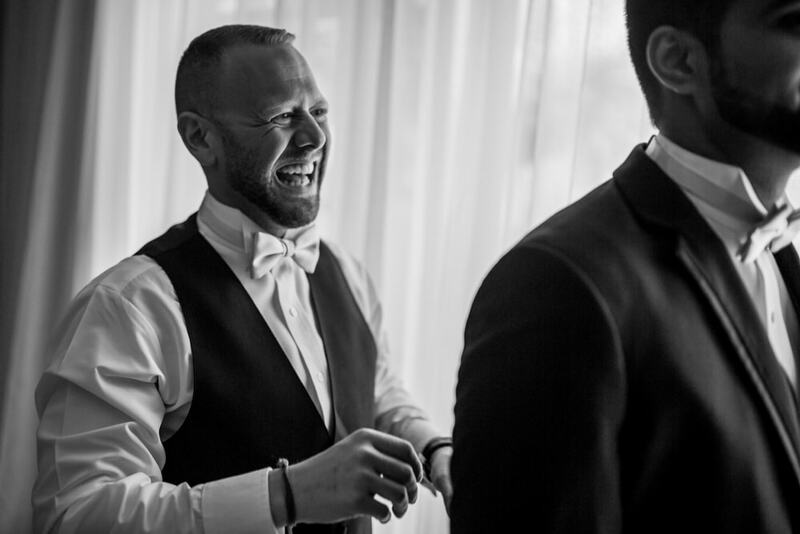 Groom had already arrived at the altar when Emcee Summit announced groomsmen and bridal party. 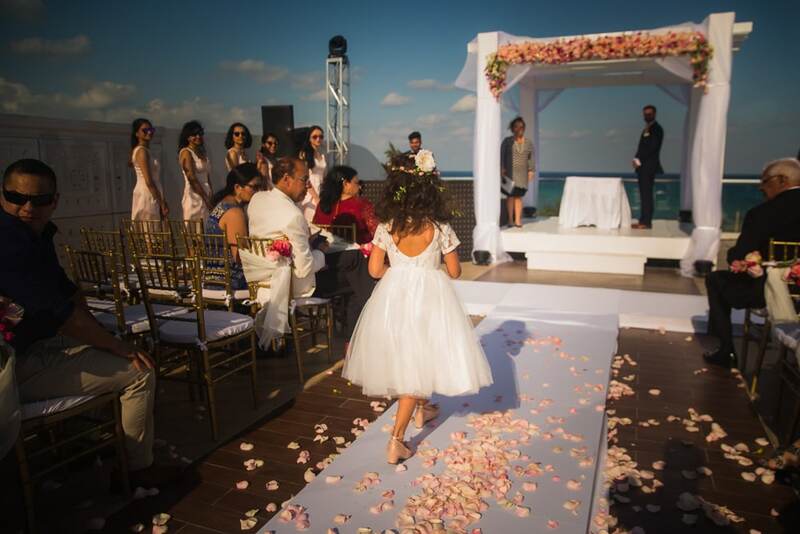 Lead by flower girl and ring bearer, the bride was requested to join the ceremony. 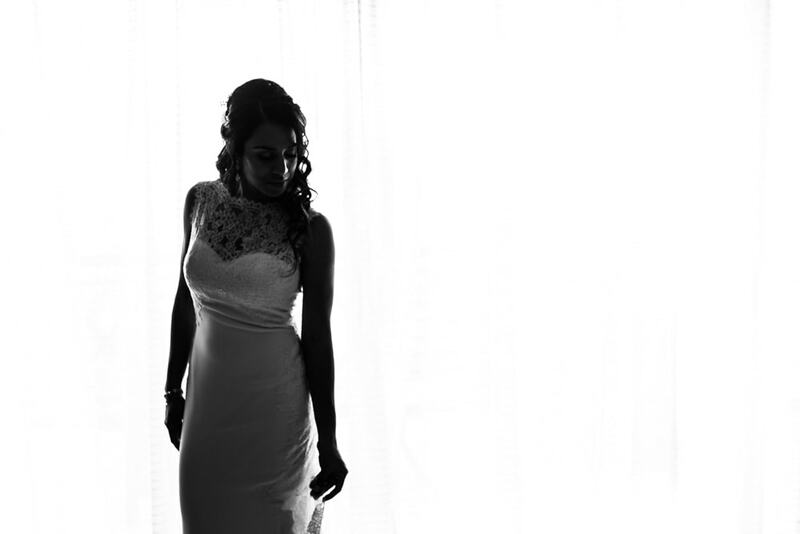 The bride wore a beautiful white lace backless dress. 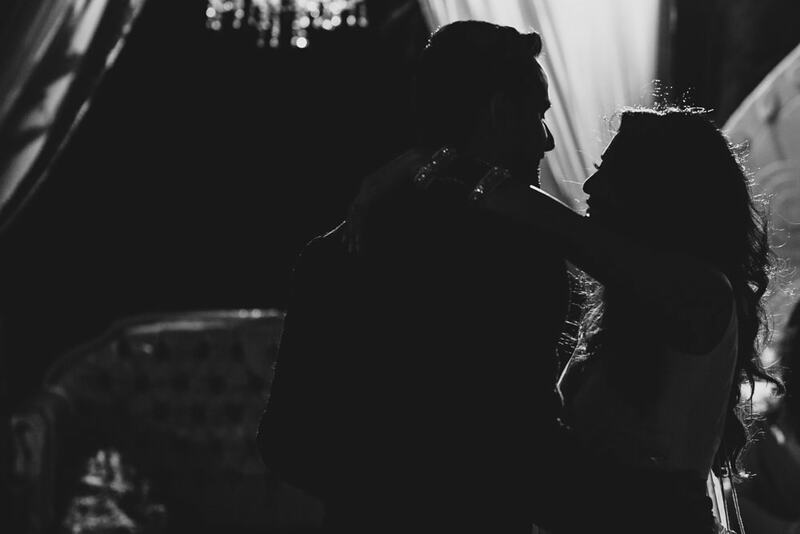 Together the couple looked absolutely stunning. 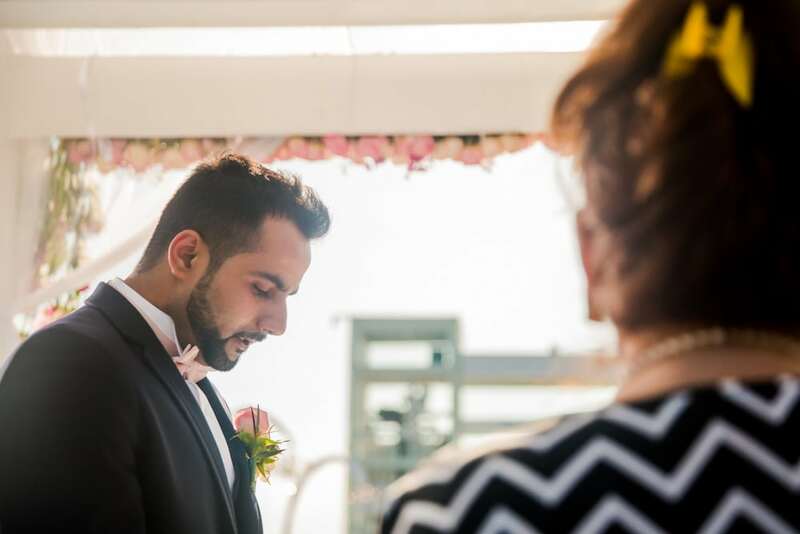 The officiant asked the groom to announce his love for his bride. 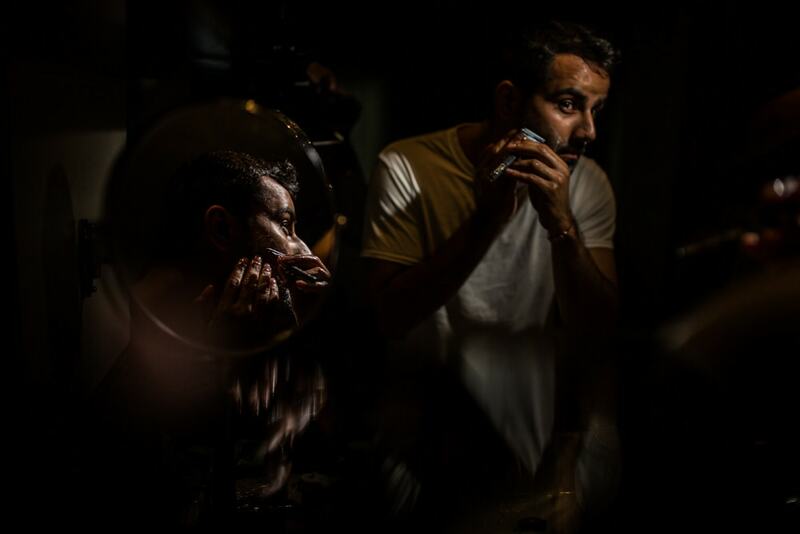 Socially men are not expected to show emotions and society will tag men with tears as weak or soft. 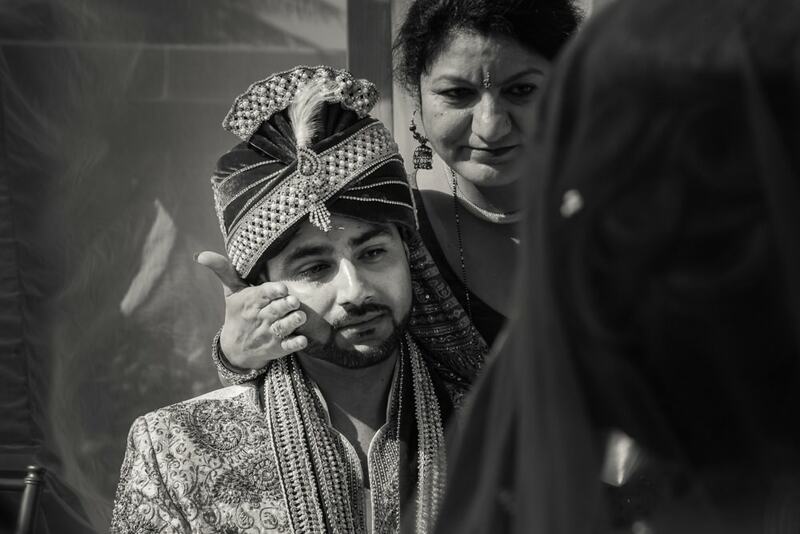 We personally photograph weddings and see men in tears all the time. 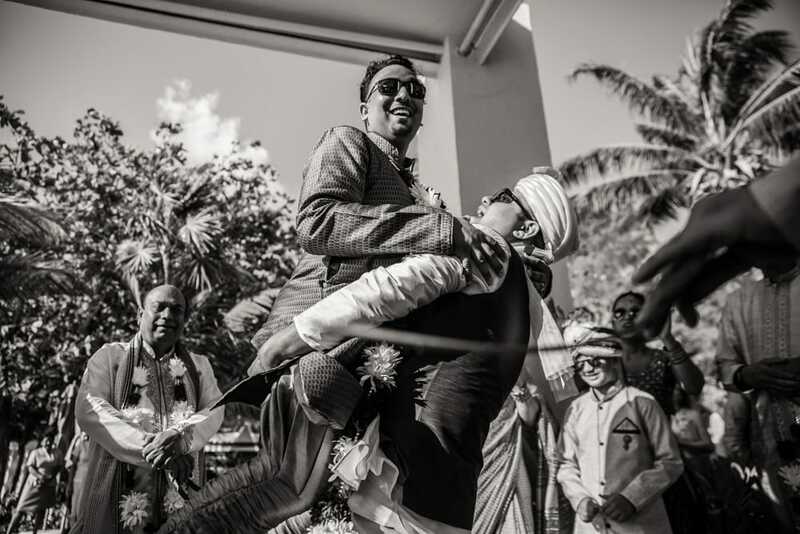 It is all about embracing the emotion and yes it is totally normal. 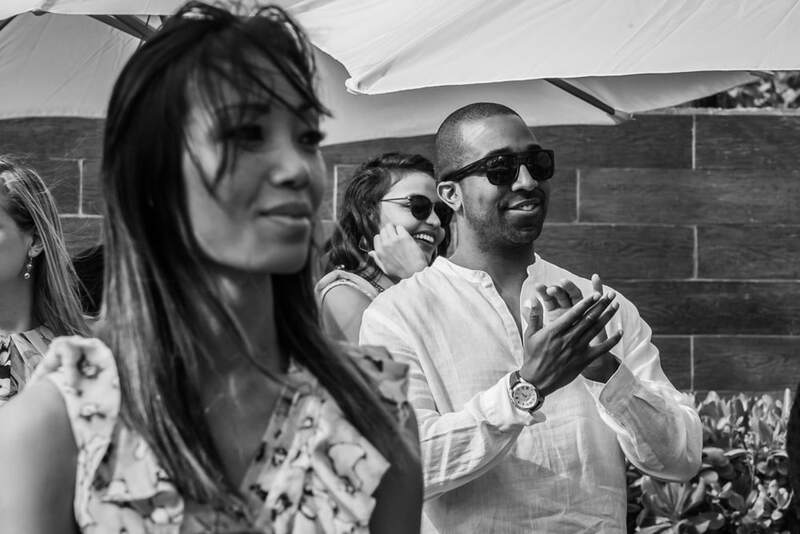 Acknowledge the love you have one another and be open to expressing. 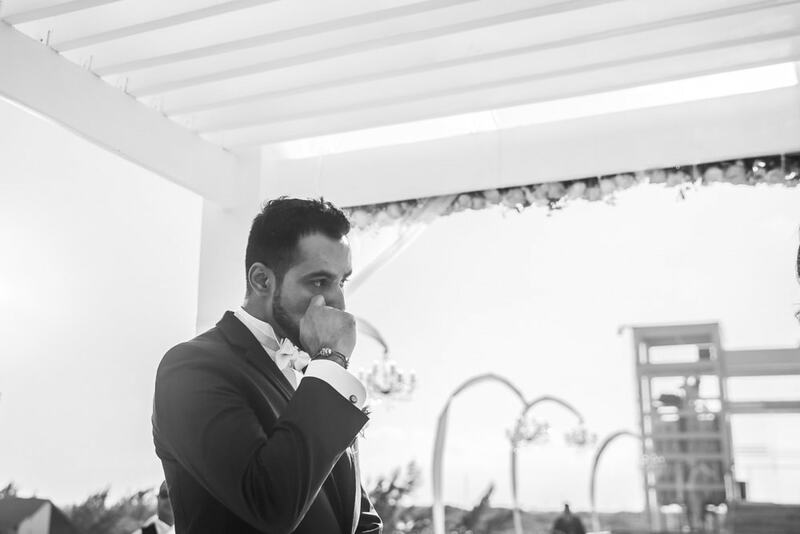 As the groom stood at the altar looking into the eyes of the love of his life, he had emotions of love, joy and much more expressed in tears and this was probably our favorite moments from this wedding. 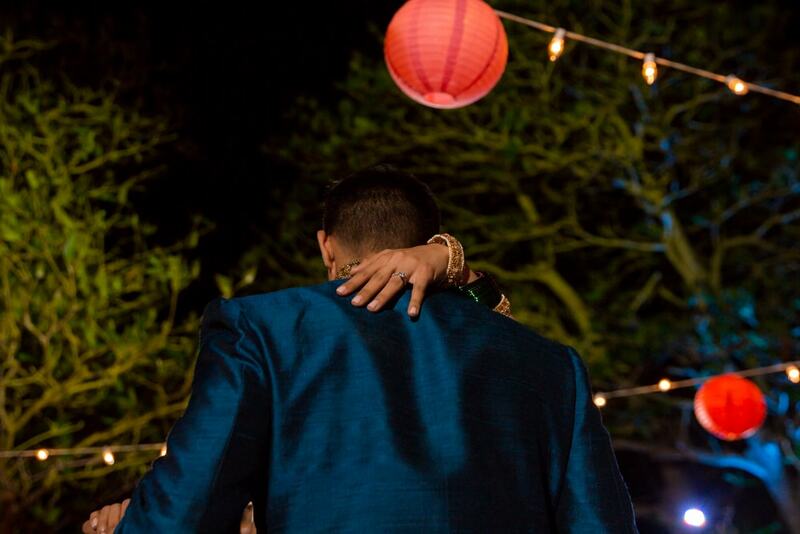 As soon the officiant of this fusion Indian destination wedding said,” you may now kiss the bride”, all the guests stood up and cheered for these two newlyweds. 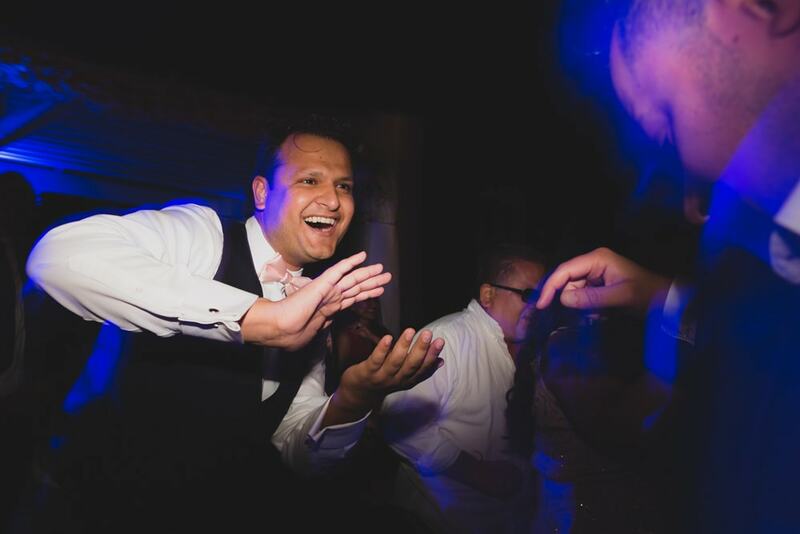 The reception was about the start and Encore Entertainment with Dj Harsh was about the making this night a memorable one. 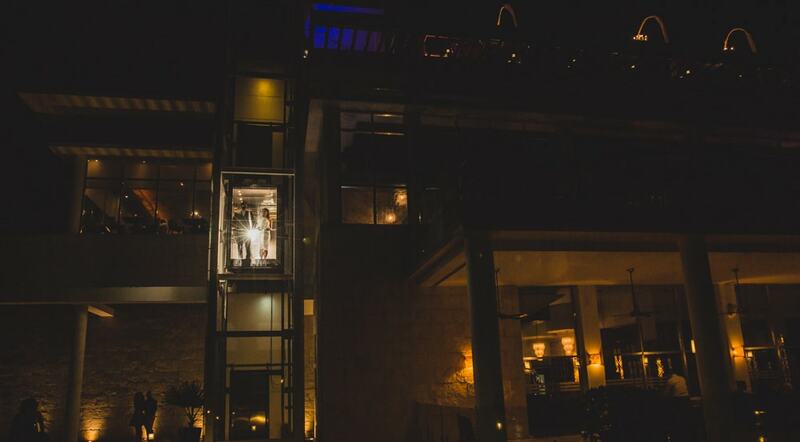 Azul Fives is one venue where you are allowed to party outside till late. 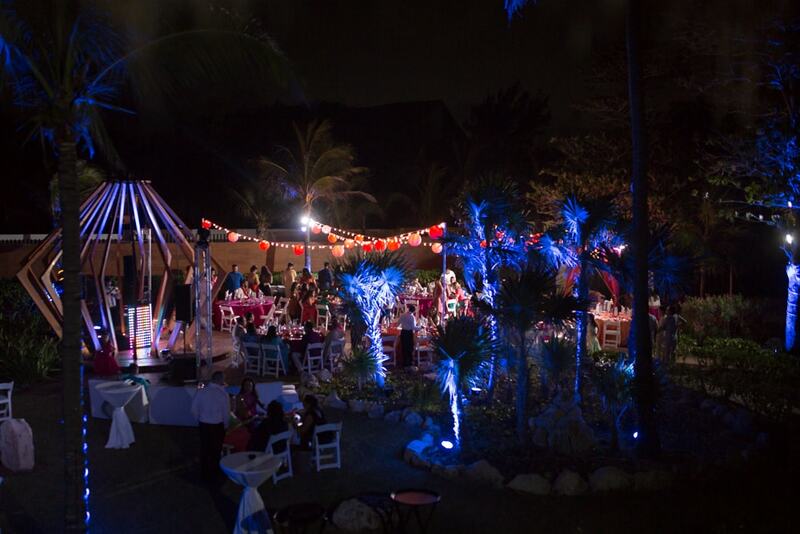 This is one of the positive things when you considering your reception venue outdoors on a destination wedding in Mexico. 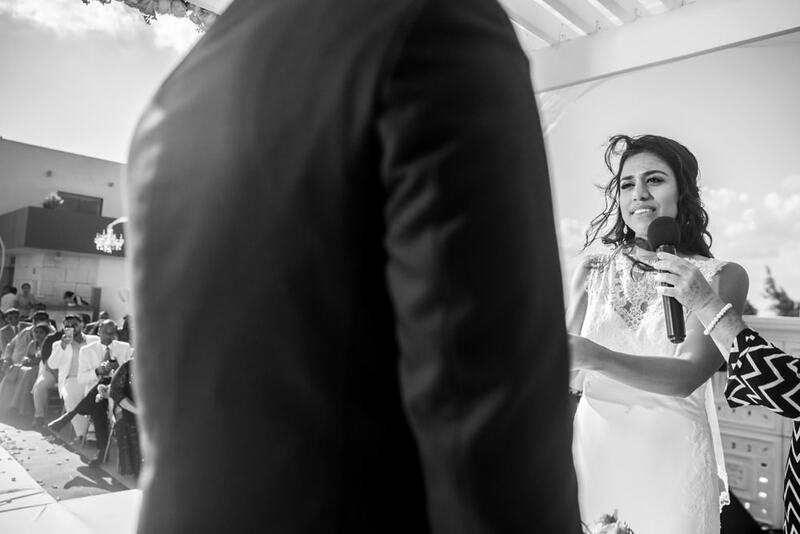 Usually, most resorts only allow playing music till 10:30 or 11:00 pm which makes an indoor venue for reception more preferable choice for many couples, especially in Indian destination weddings in Mexico. 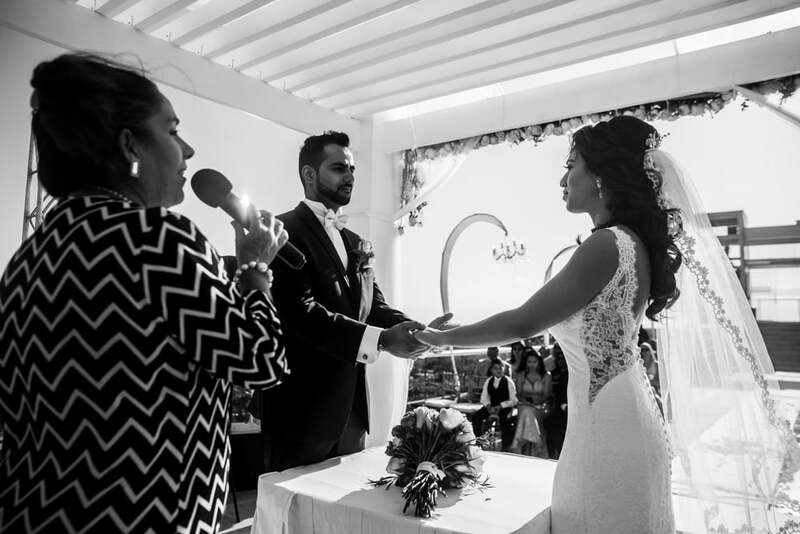 Latin converted the Christian ceremony setup at the Sky deck into an intimate reception venue. 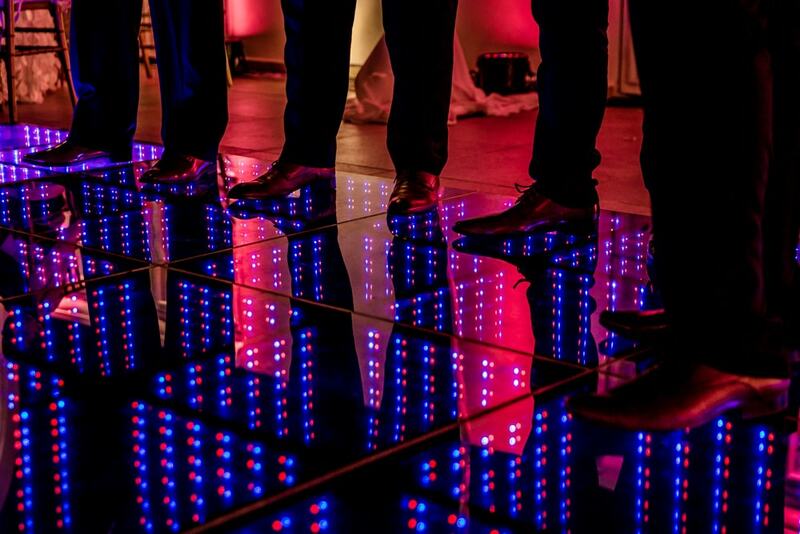 Some beautiful flowers, a black led dance floor and tables with mayan jugulars. 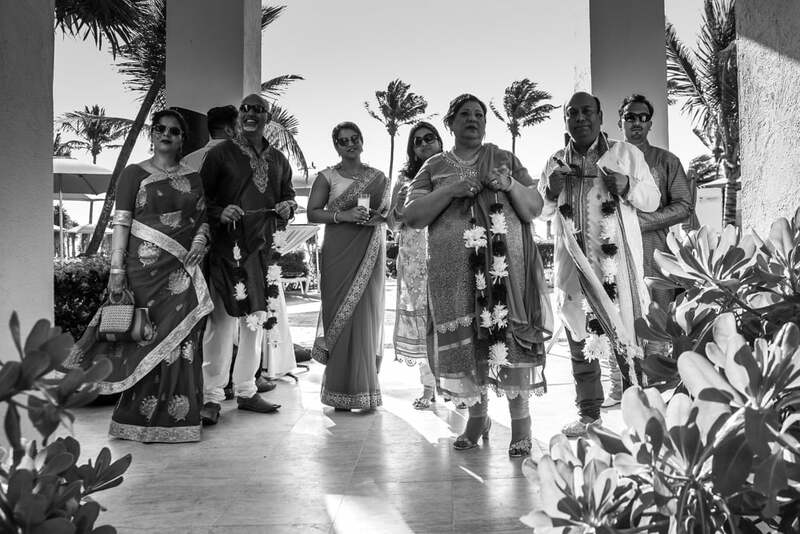 Latin Asia went above and beyond in making this wedding more personalized for the couple with their printed on each wedding favors.Soon the reception night was about to begin as the sun was setting up in behind us at the Azul Fives and this Indian wedding party was about to make a celebration at this Mexican reception venue. 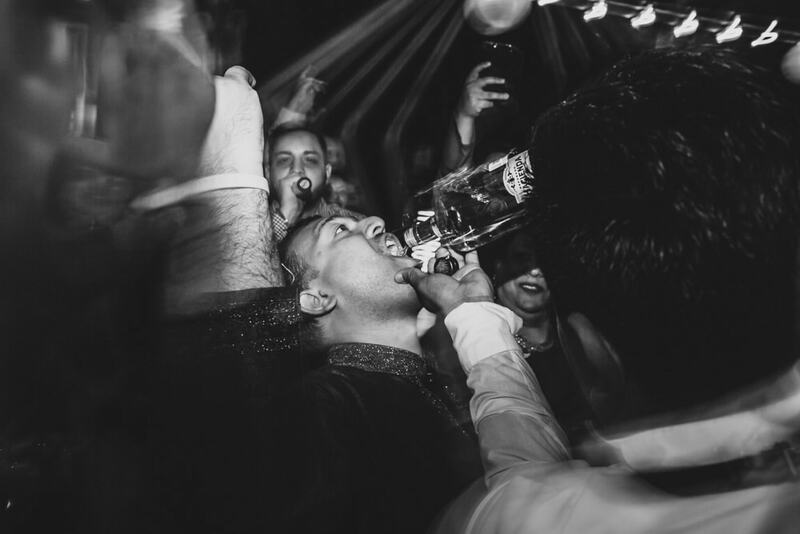 As the bridal party walked in along with the couple everyone had tequila shots to kick the party. 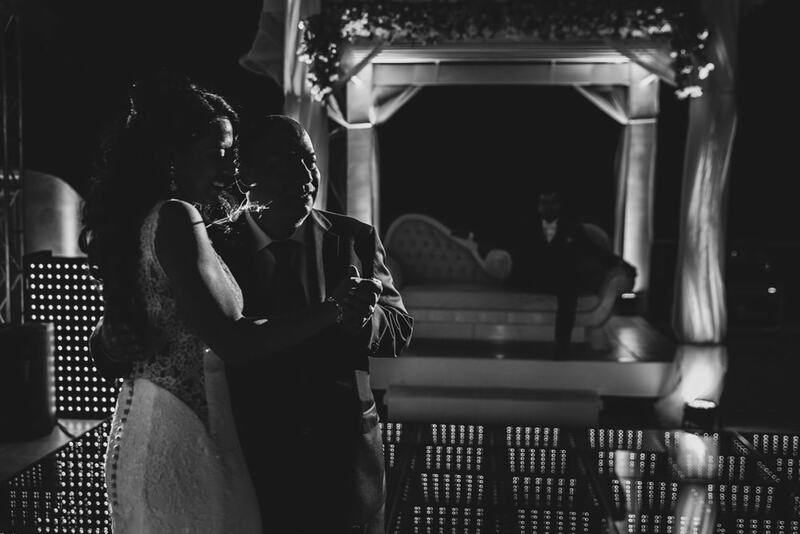 We had the first dance and daddy daughter song along with sister-in-law and Groom dance to kick the night.Groom and bride for this Indian destination wedding share a very close intimate relationship with their friends. 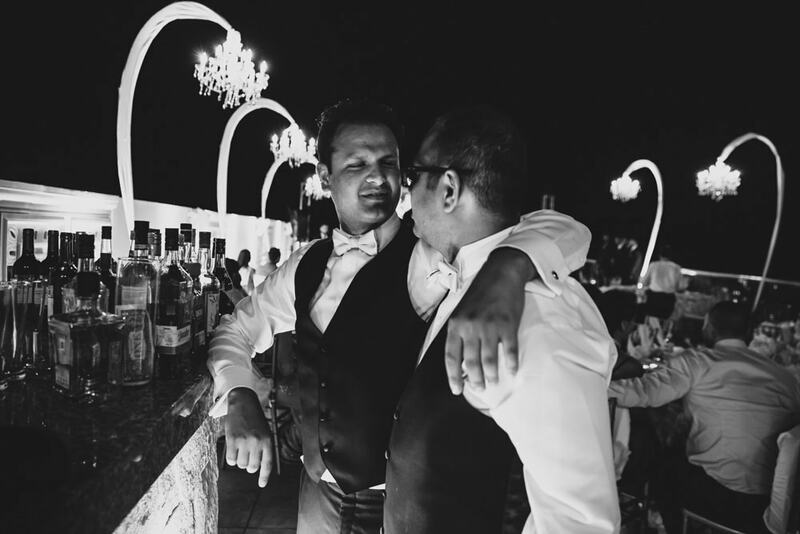 It was time for these friends to share some of their memories with the guests. 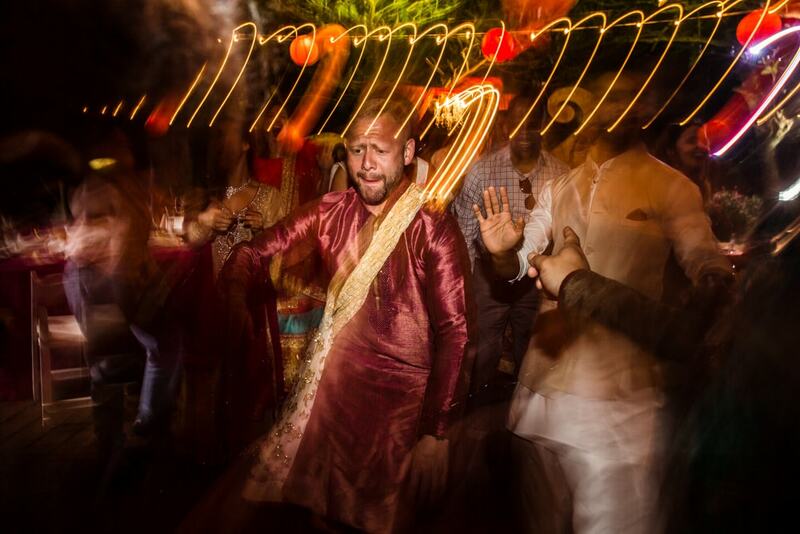 Speeches were done and now it was time kick of the dance floor before that guests were served by Indian food from Taste of India, a fine dine restaurant based in Cancun. 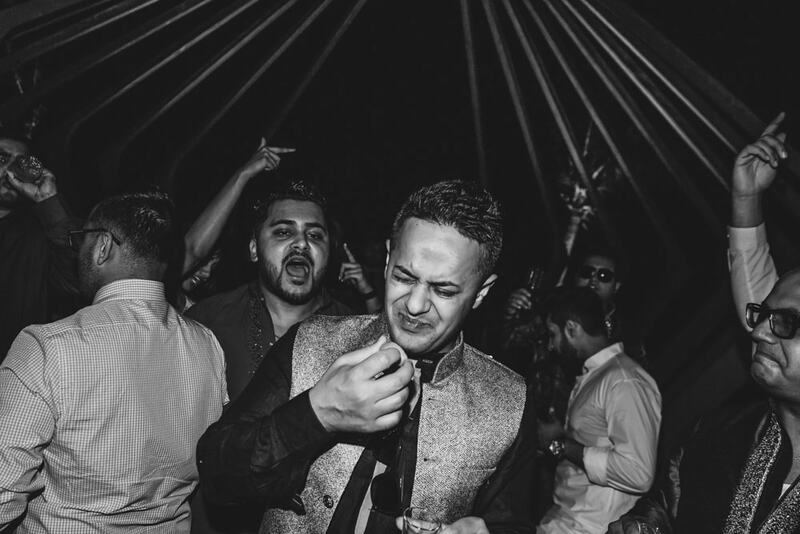 Taste of India is one big vendor you can trust for all your catering needs in Cancun or Playa del Carmen for your destination weddingsDance floor kicked in and there as nothing stopped anyone to swing their hands in air when DJ Harsh and Summit Dholi are playing together and when say everything even the rain. 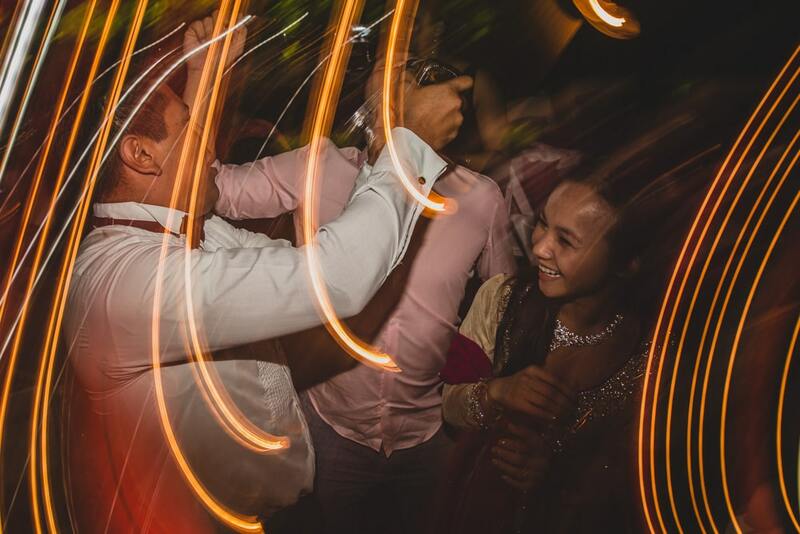 5 mins of drizzle didn’t stop the dancefloor going and party was as they lit.We can thank this couple for trusting our work and having faith in us even when we asked them to jump in the pool with us for underwater images. 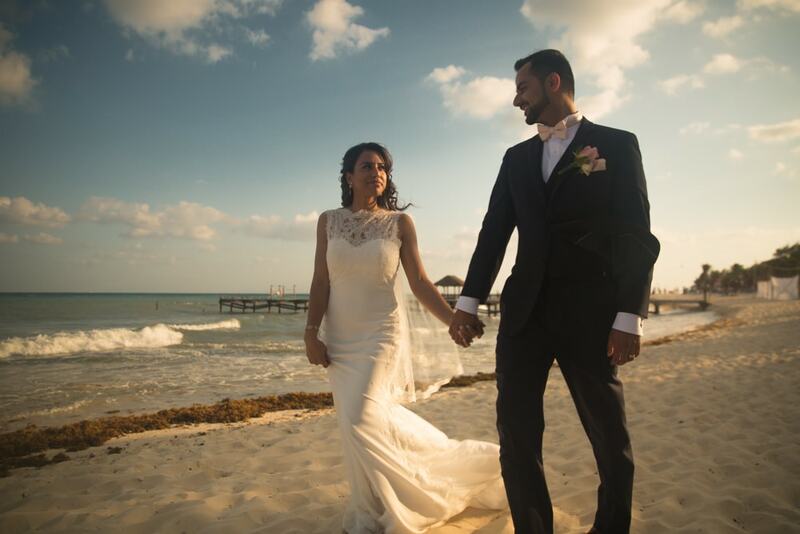 As destination wedding Photographers, we always seek to incorporate the venue or essence of the location in our pictures and we ended this Indian Destination wedding at Playa del carmen in the pool dipping out the camera to get some underwater images and this couple trusted us for it. 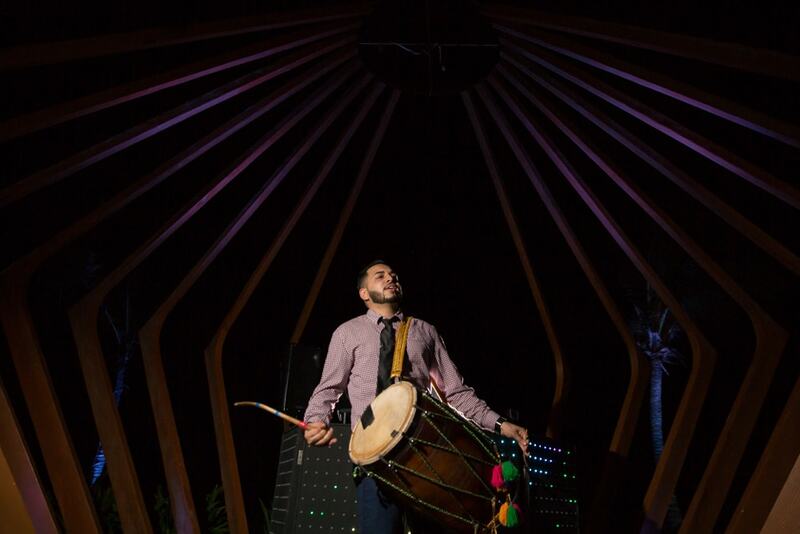 EMCEE and Dhol – Summit Dholi. 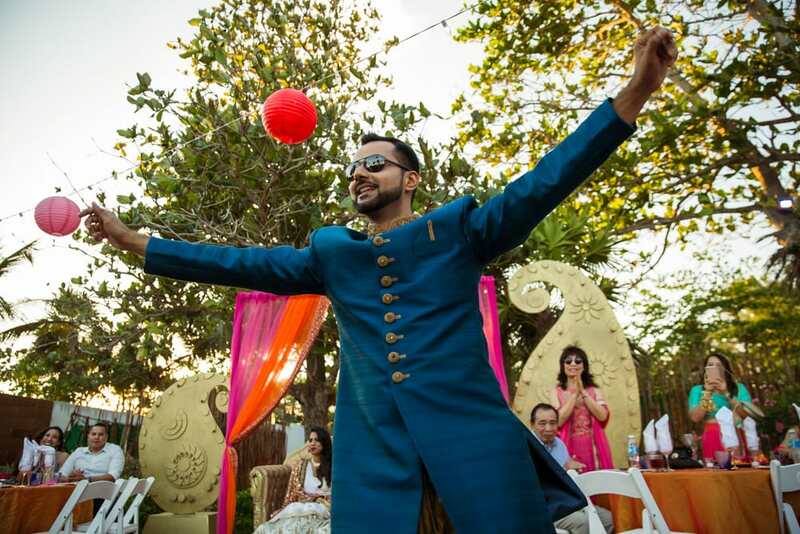 Dholi Sumit and Encore Events really made it the barrage for this destination wedding to get in the mood. 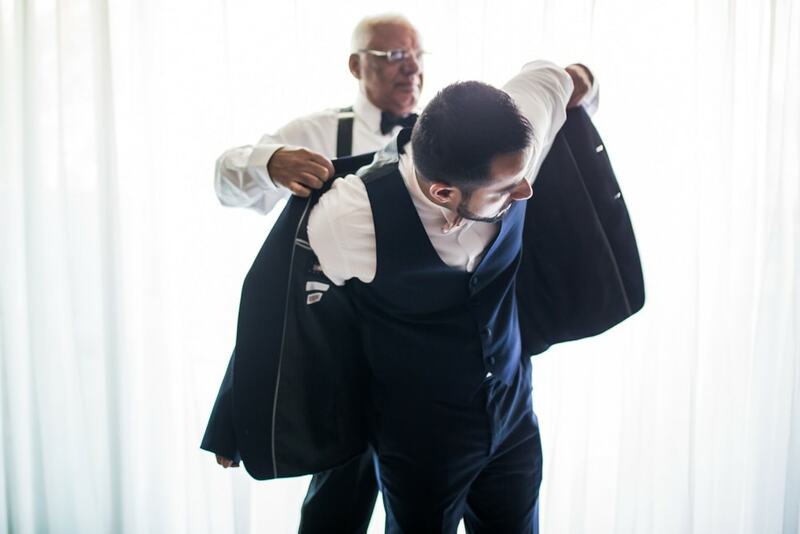 The bride and groom had adjacent suites, which made it very convenient for the couple to organize logistics and for us photographers documenting their wedding day.